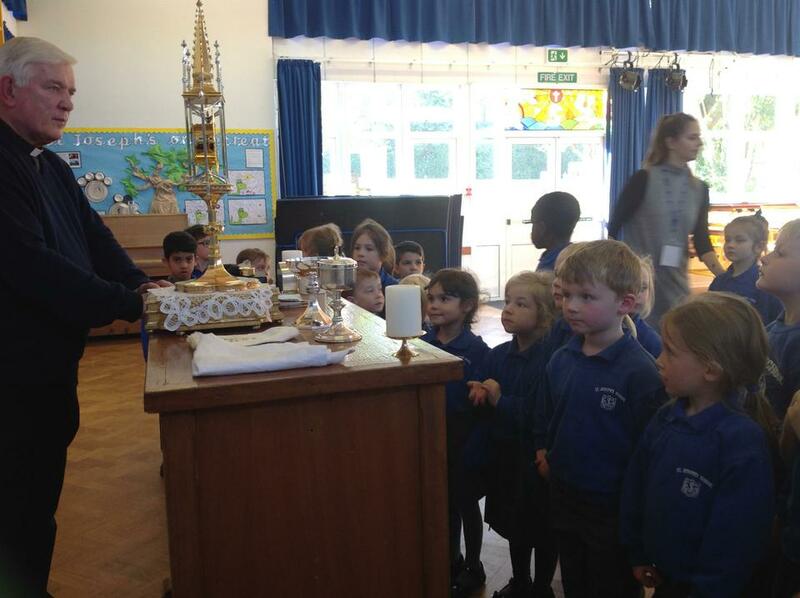 This week has been 'Spirituality Week'. 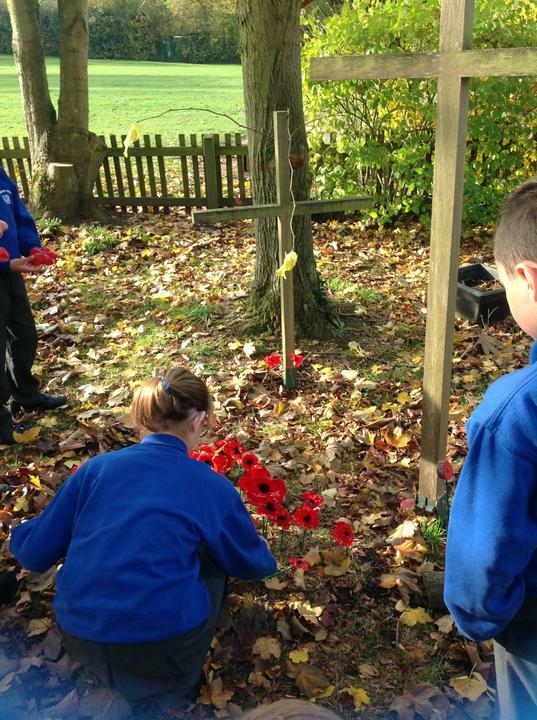 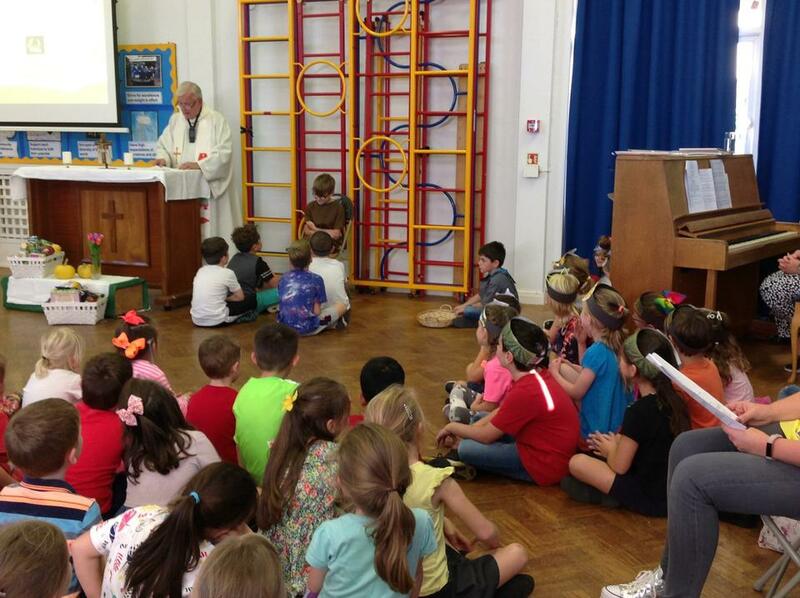 There has been a special focus on spending some time with God throughout the school day through prayer, meditation and creativity. 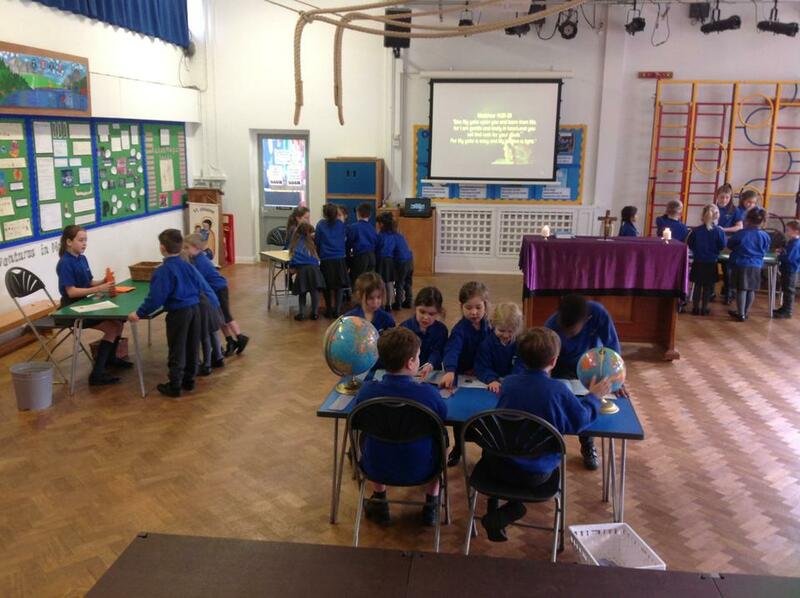 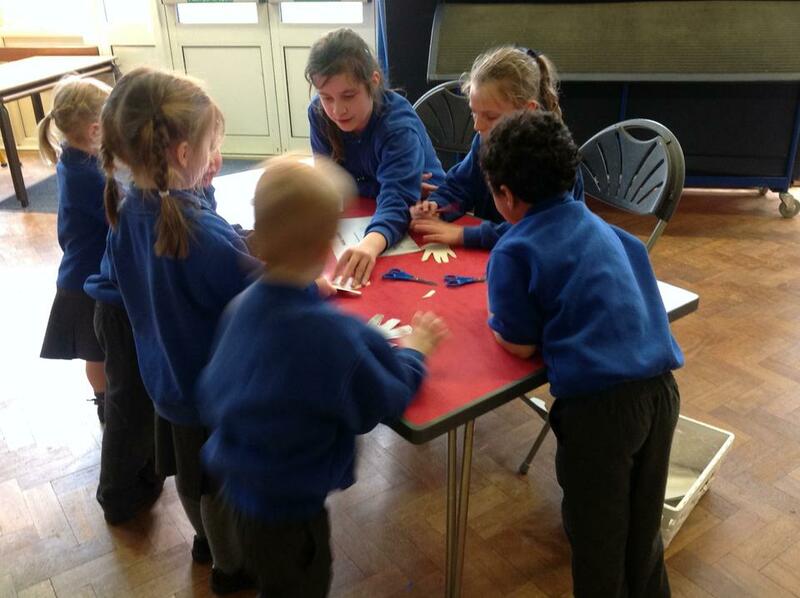 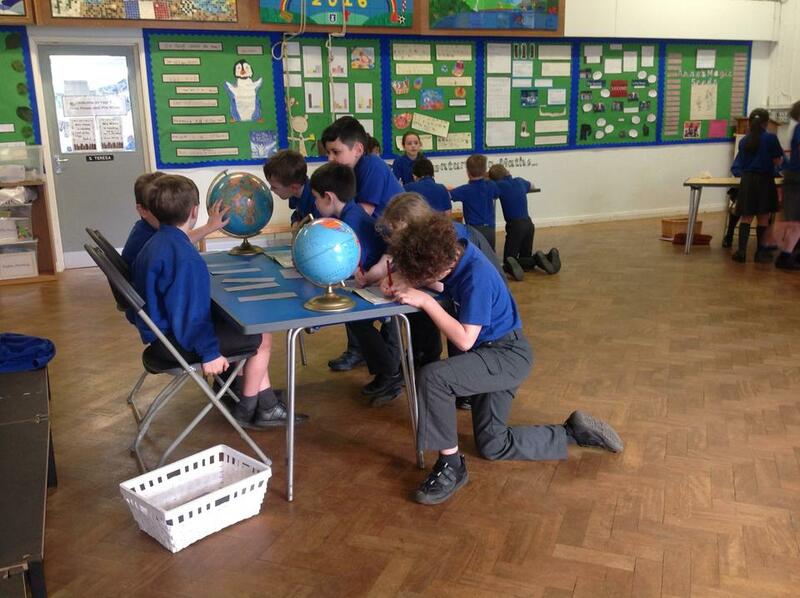 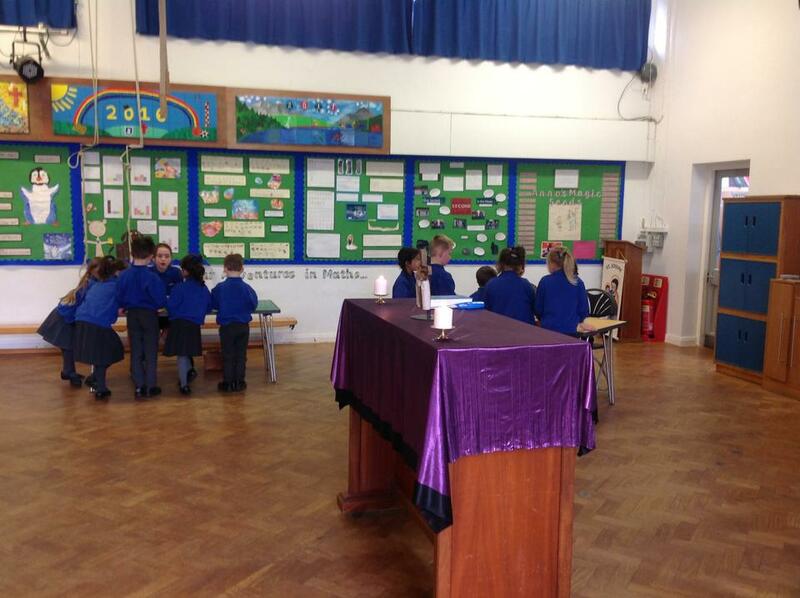 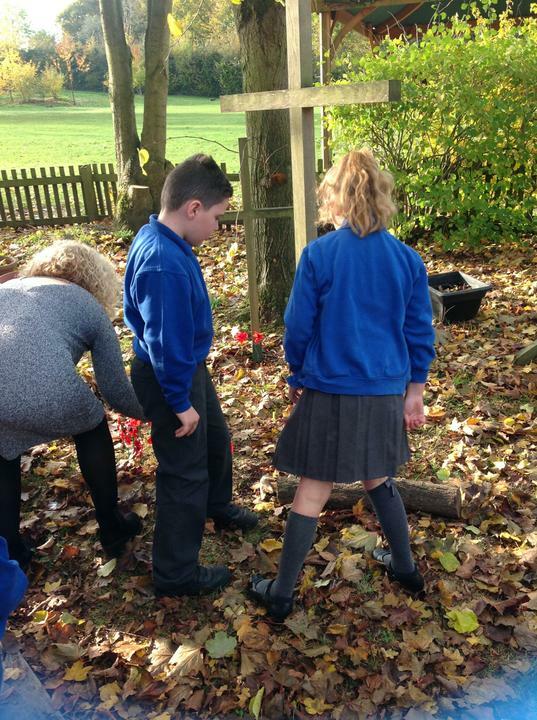 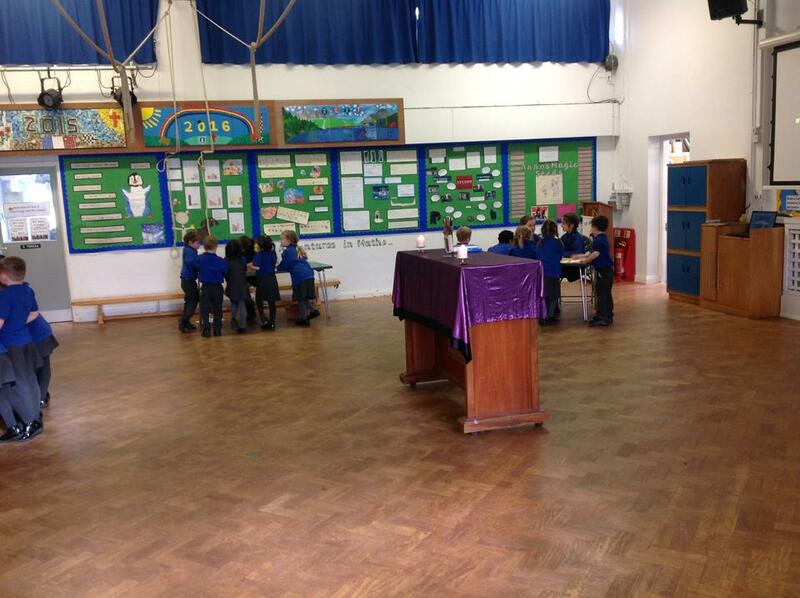 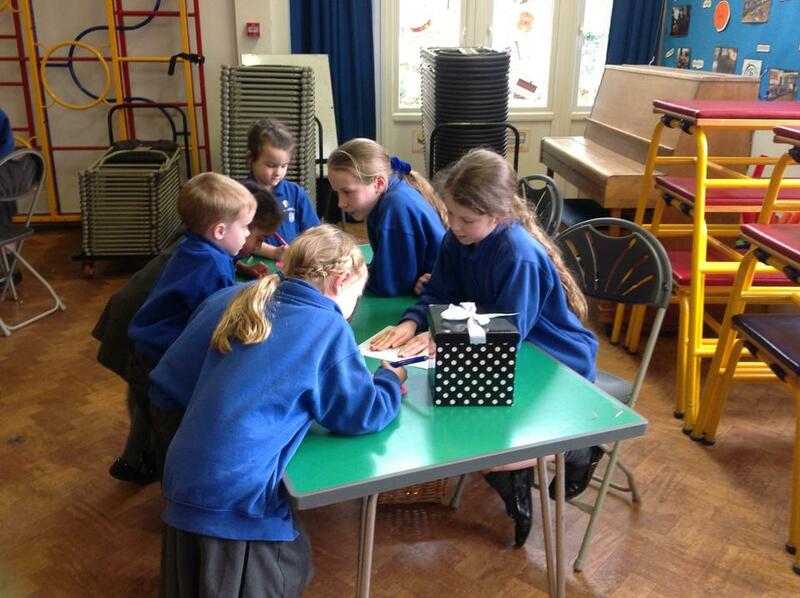 The Chaplaincy Team led two afternoons of prayer this week and the prayer stations in the hall proved to be a prayerful and spiritual time for all. 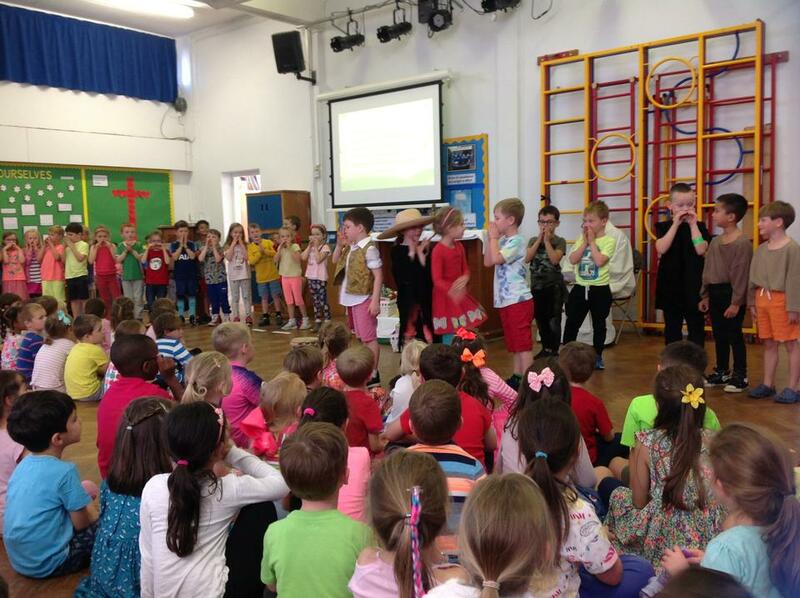 Today we have been raising money for Comic Relief by wearing red. 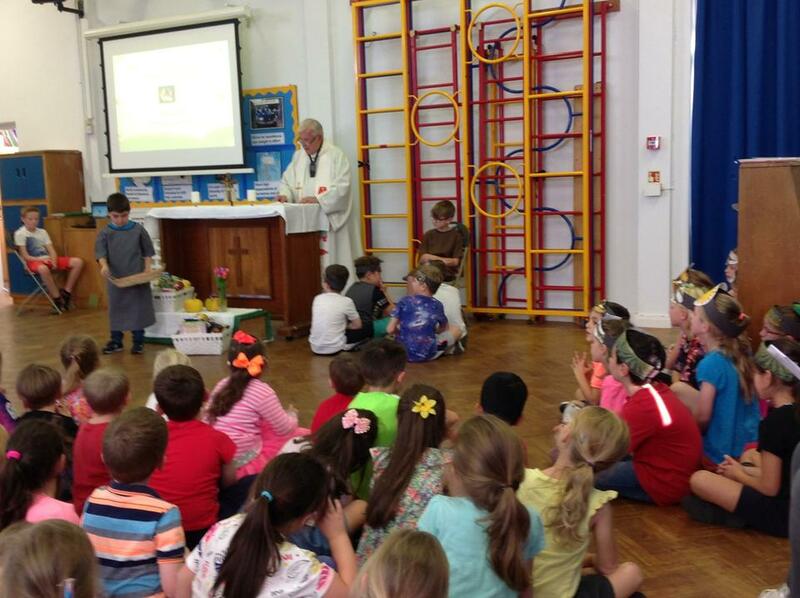 Given that it is also Family Fast Day we have collected food for our local food bank. 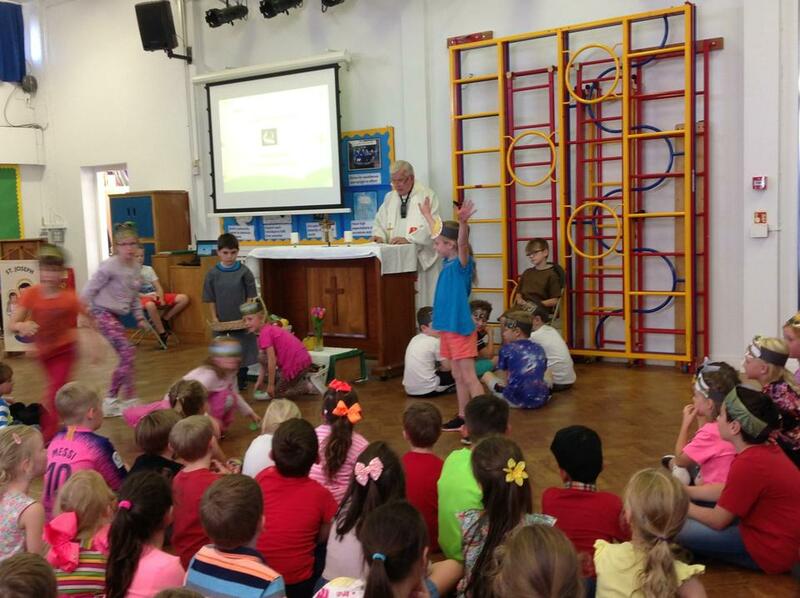 We are also taking part in the CAFOD, 'Give it Up' challenge by giving something up during Lent and collecting money in the CAFOD collection boxes. 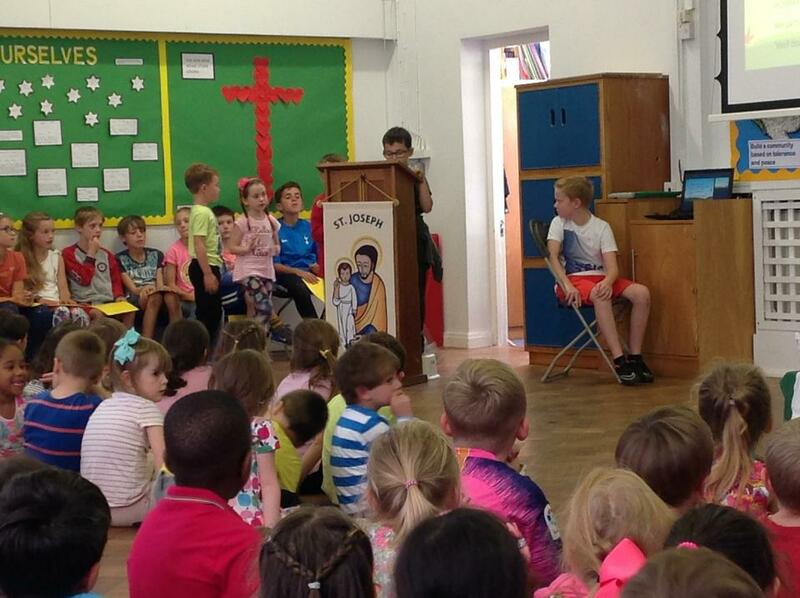 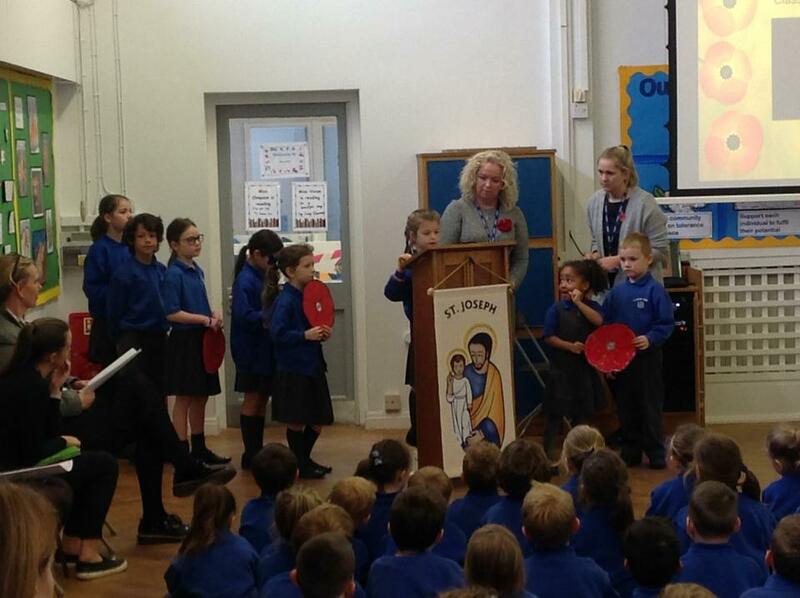 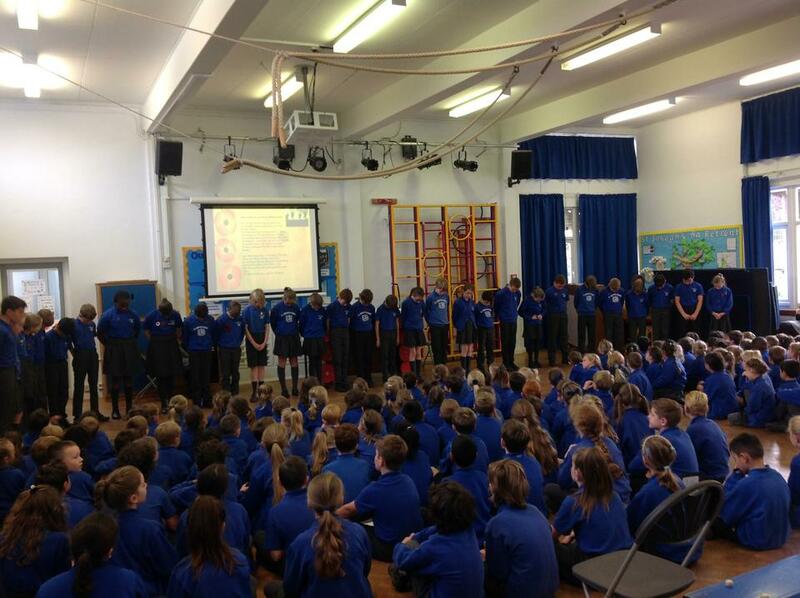 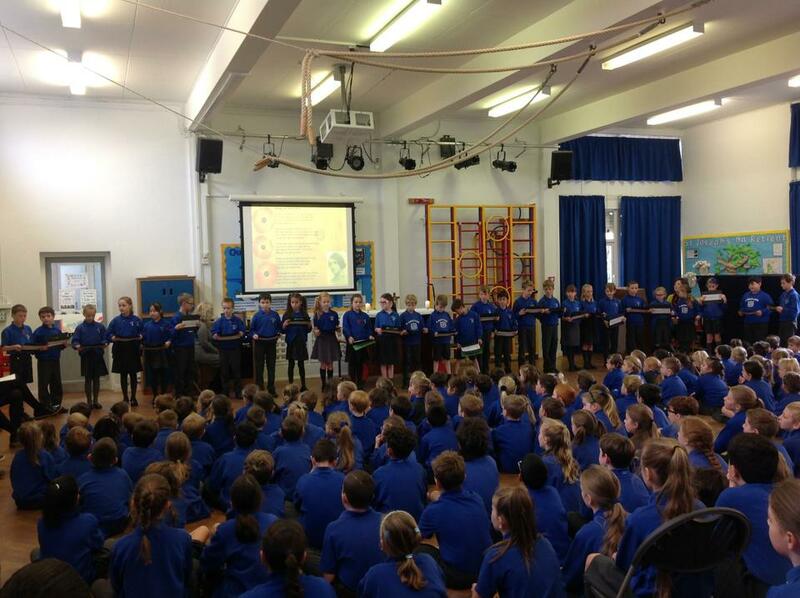 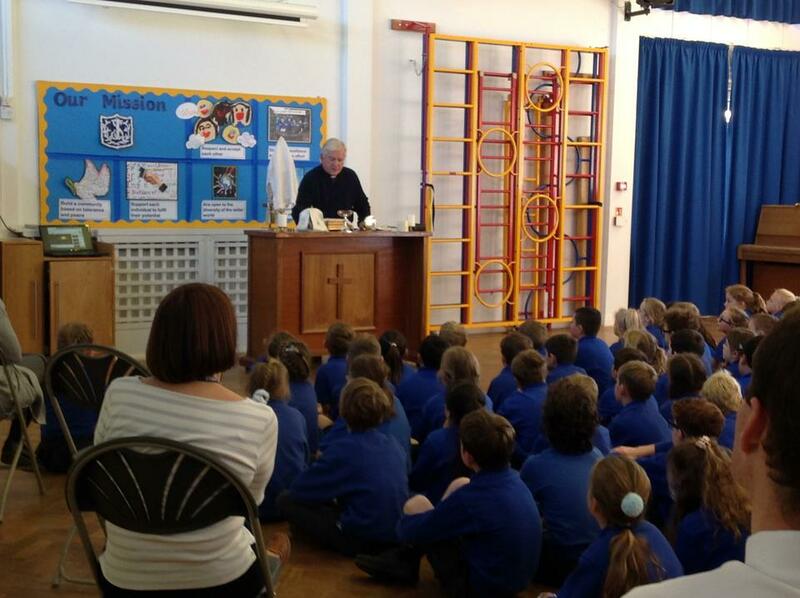 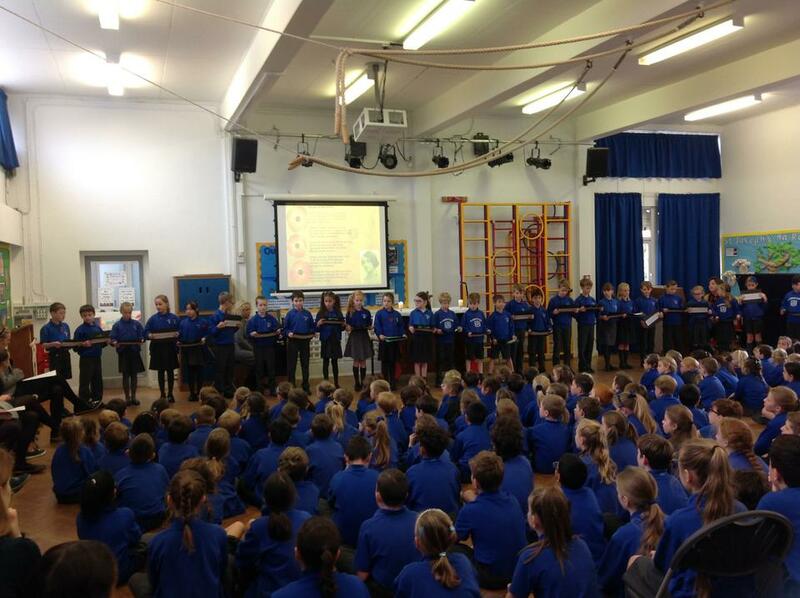 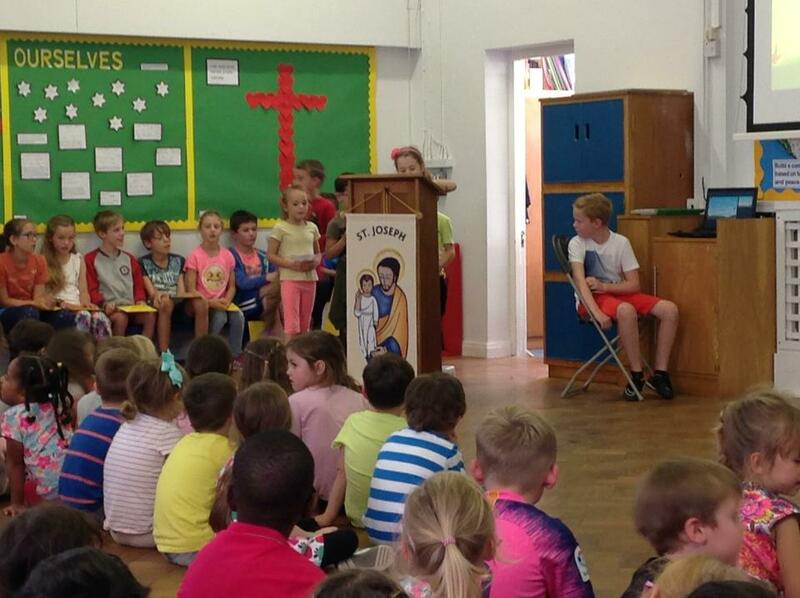 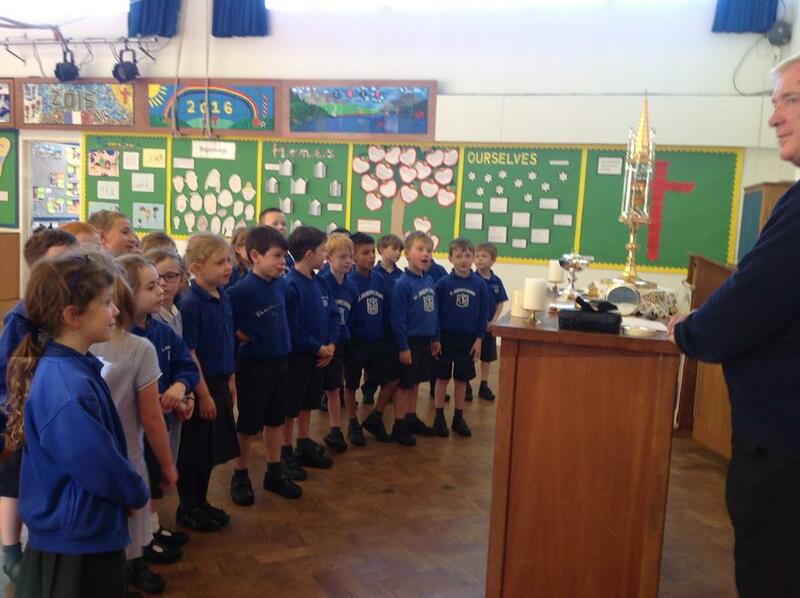 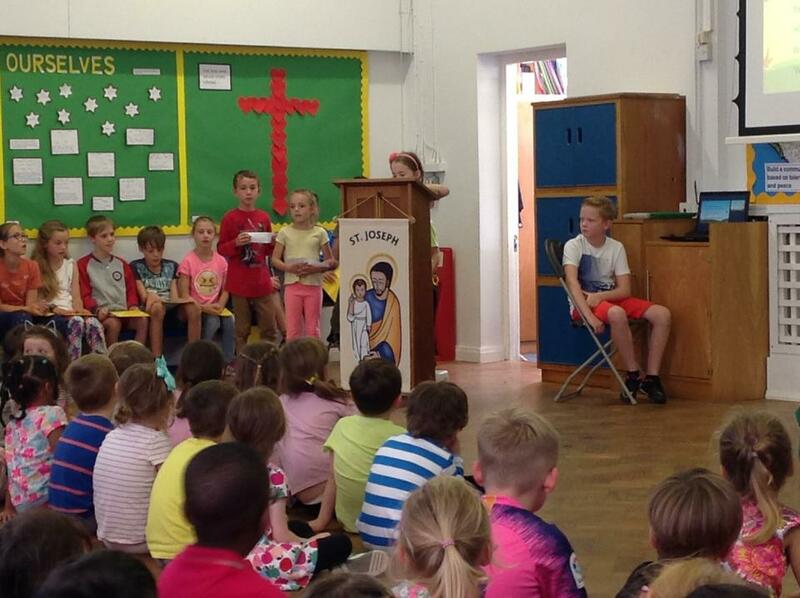 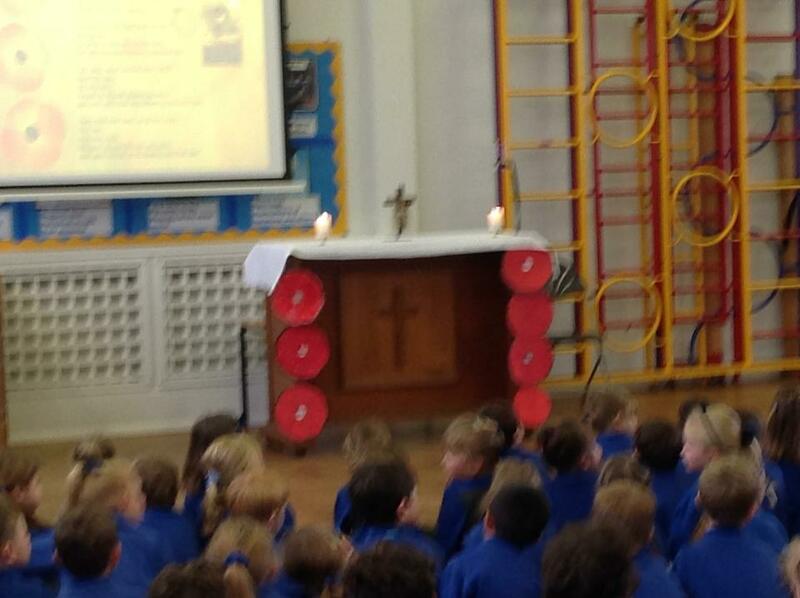 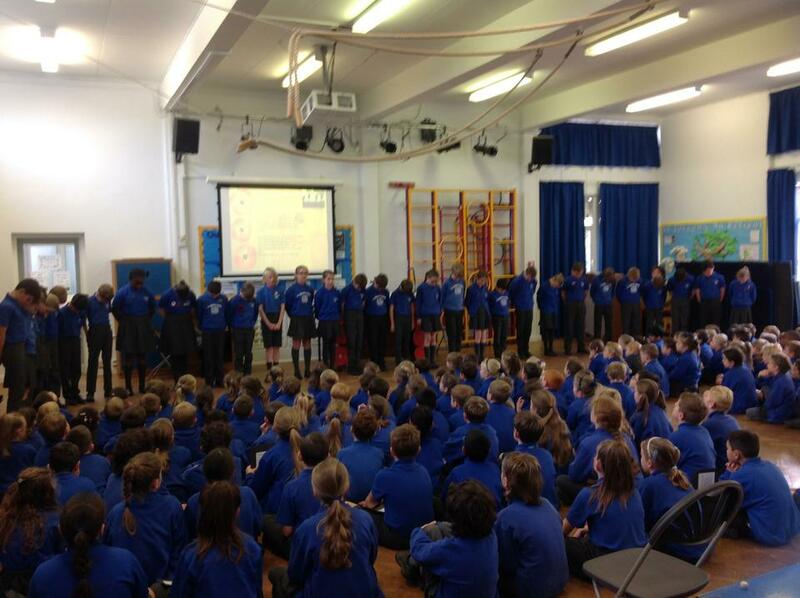 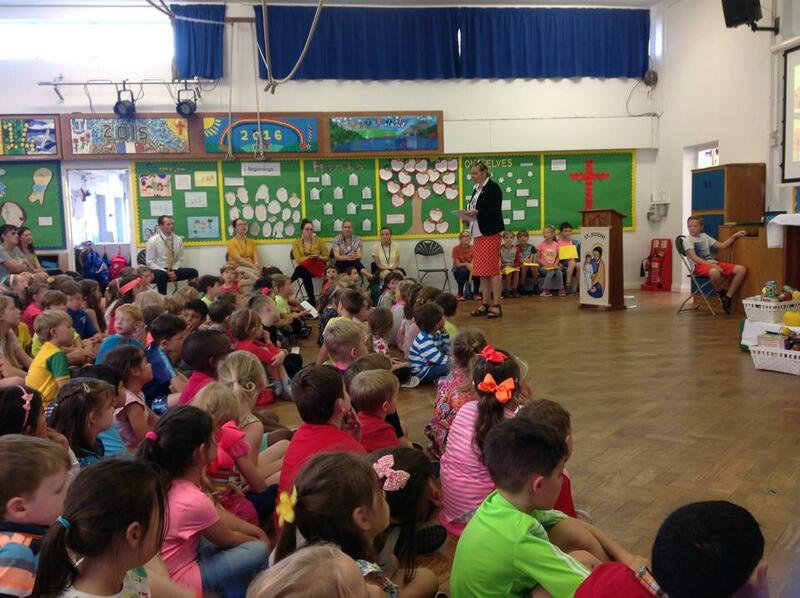 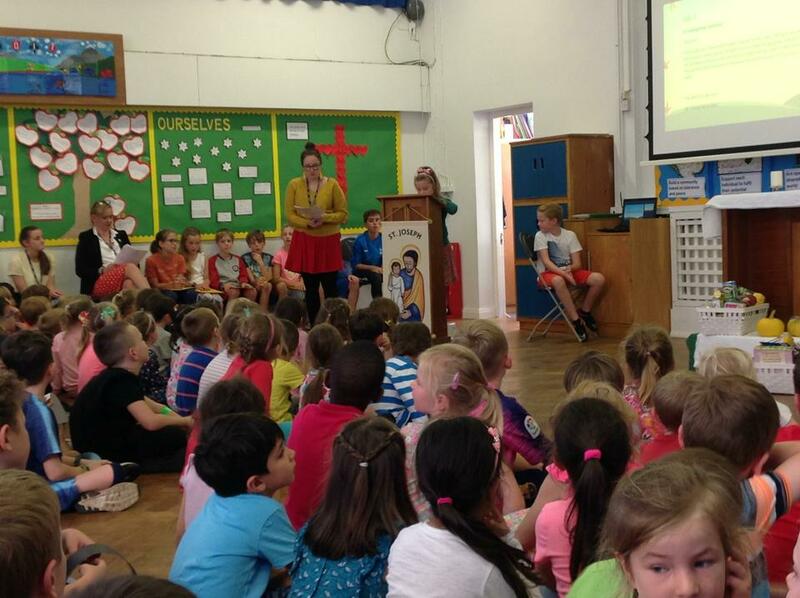 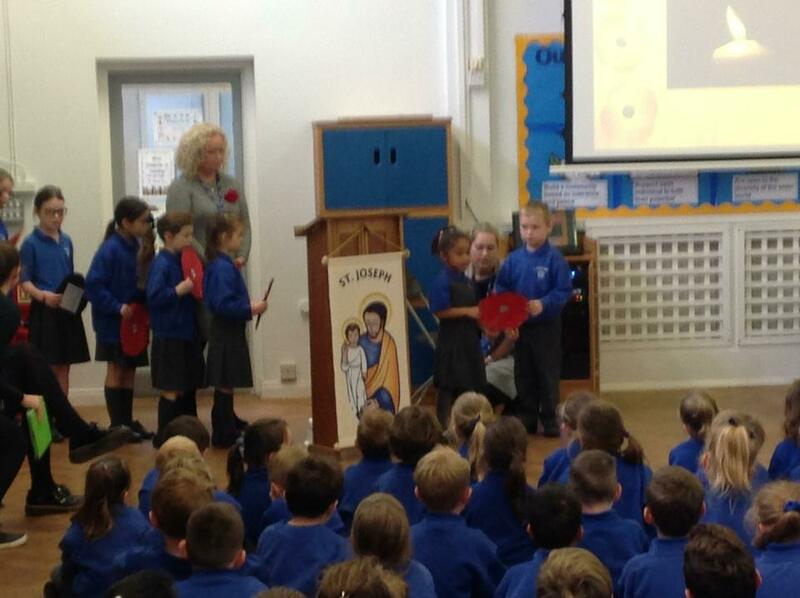 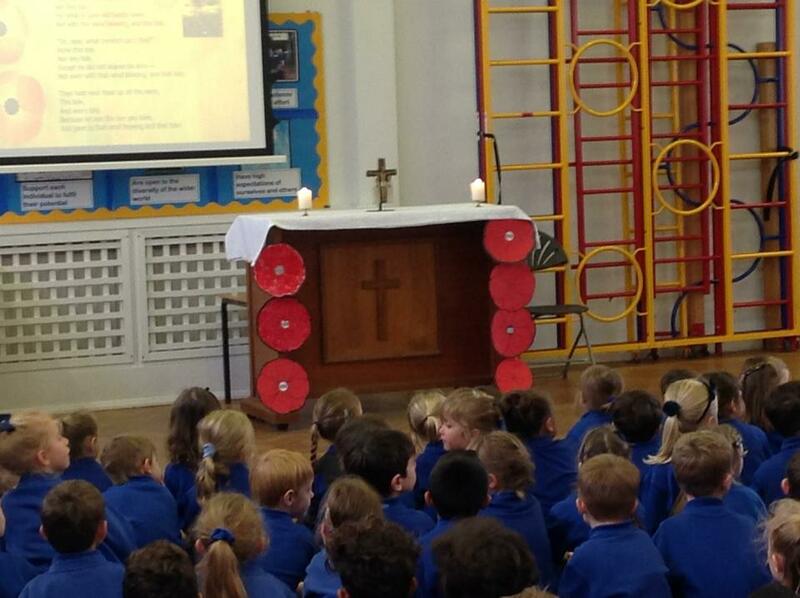 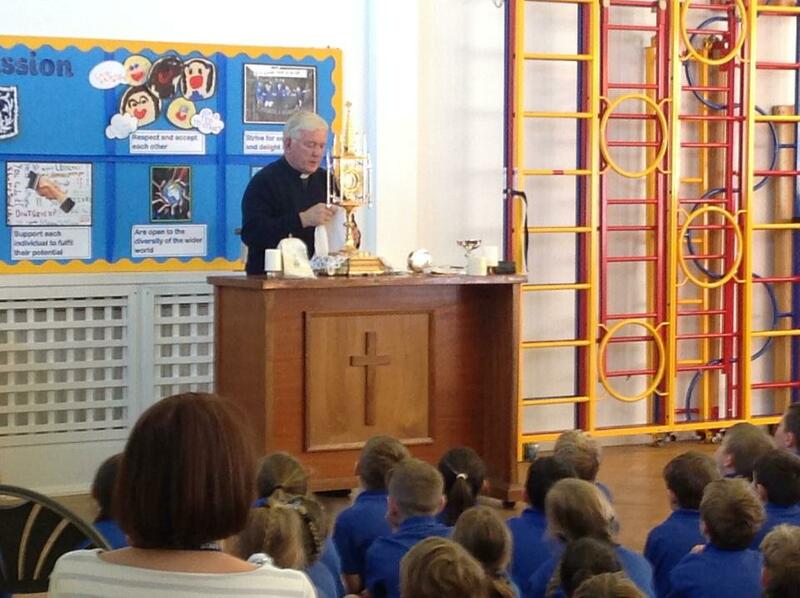 The chaplaincy team led a whole school mass to mark the beginning of the new term and calendar. 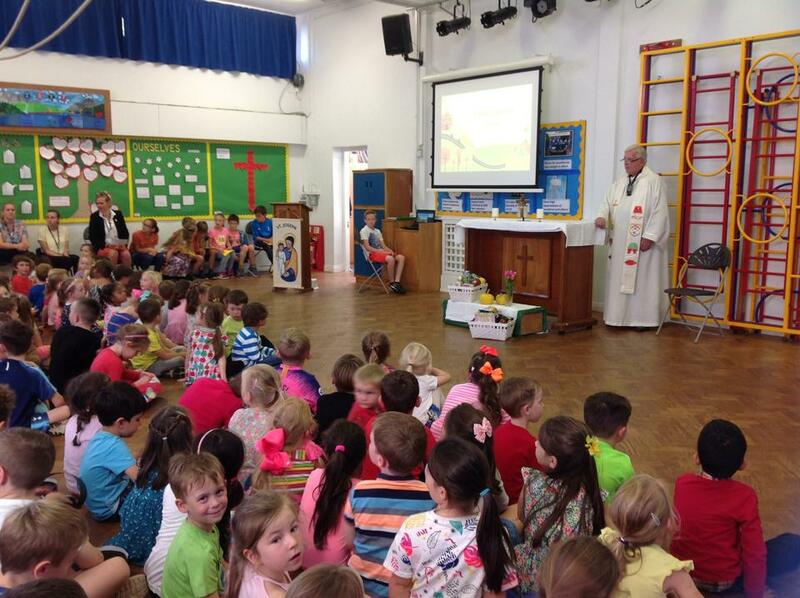 The theme was the Baptism of the Lord, renewal and hope. 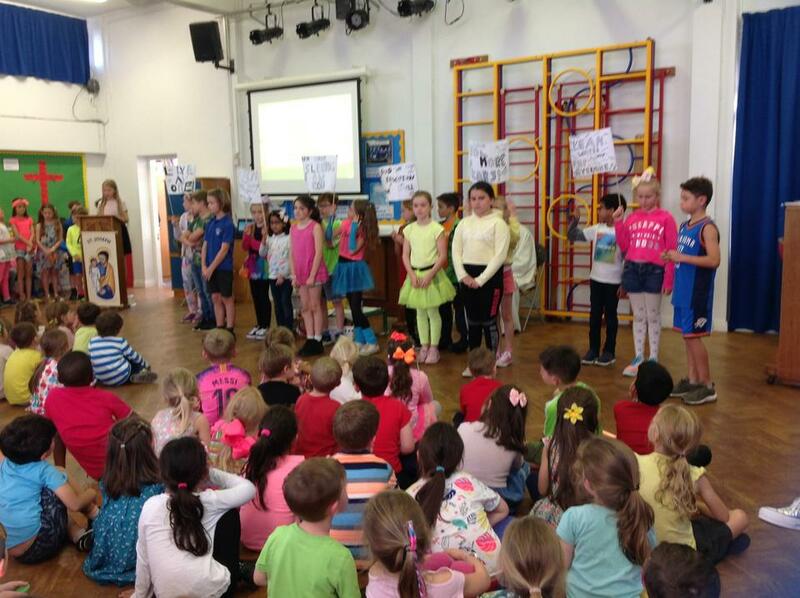 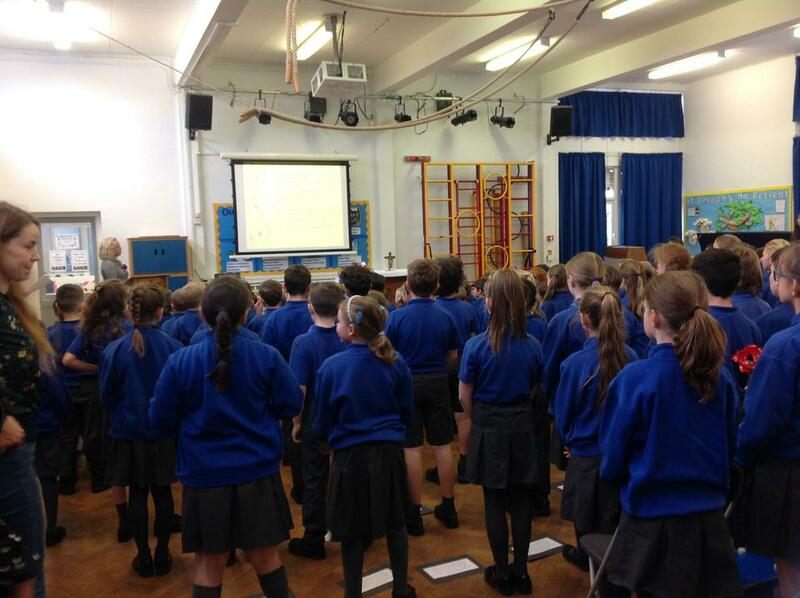 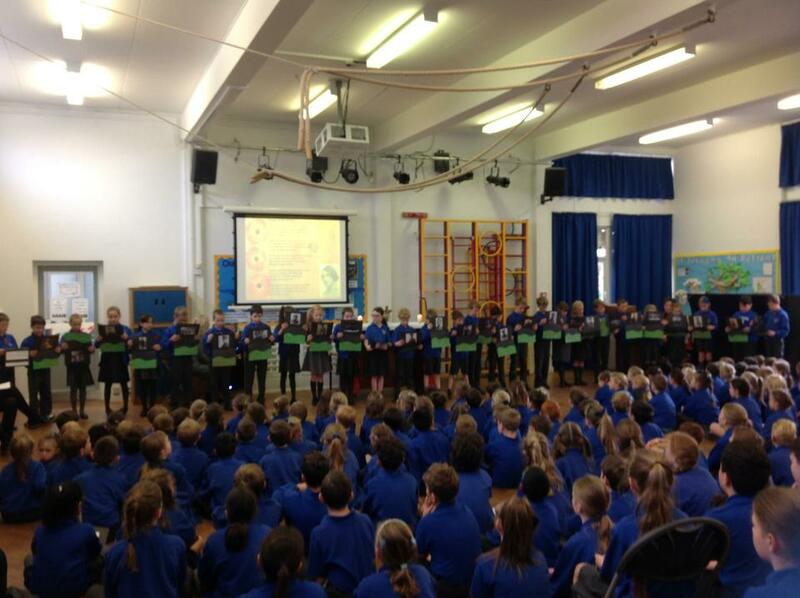 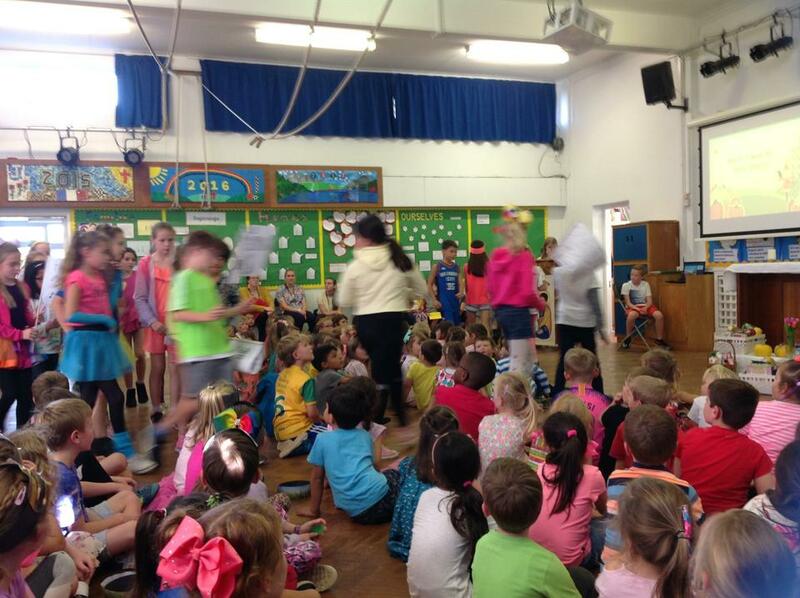 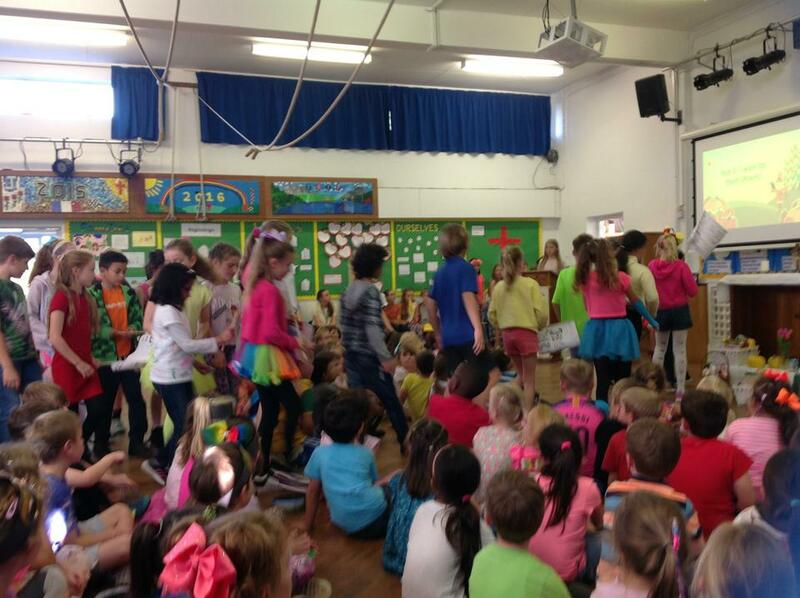 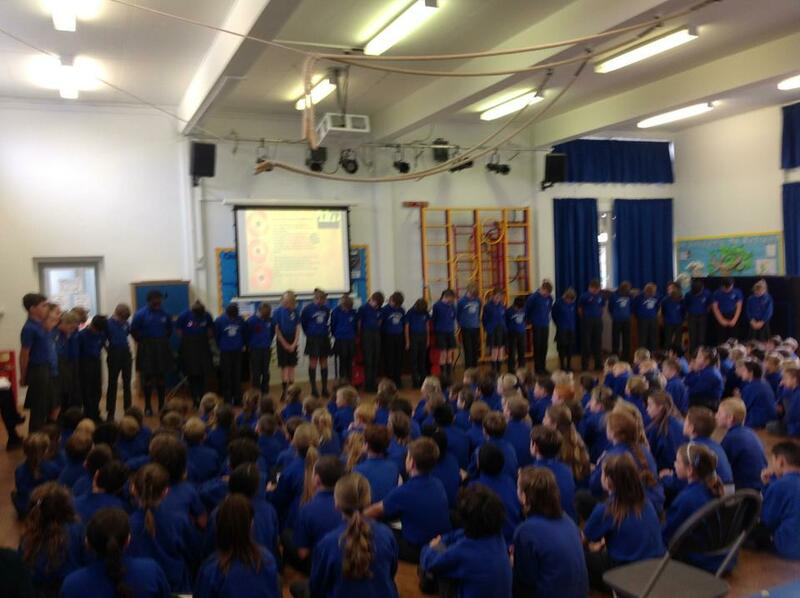 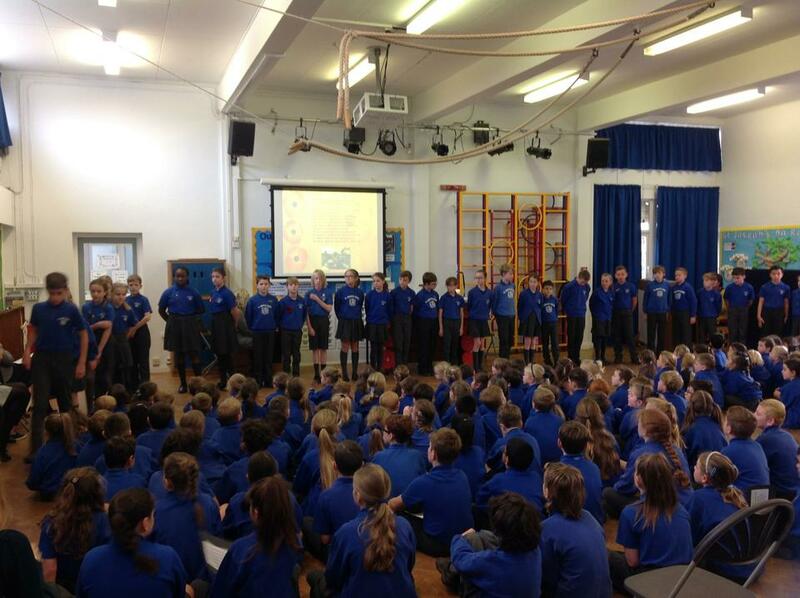 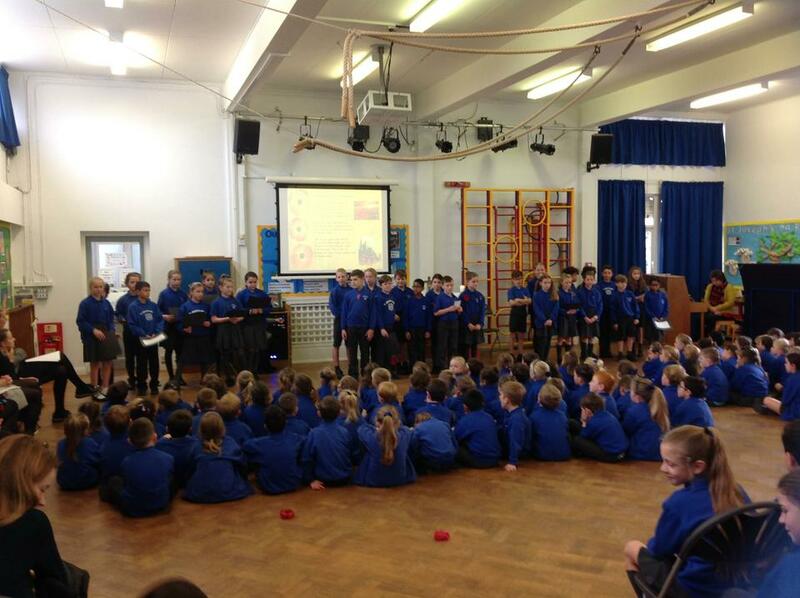 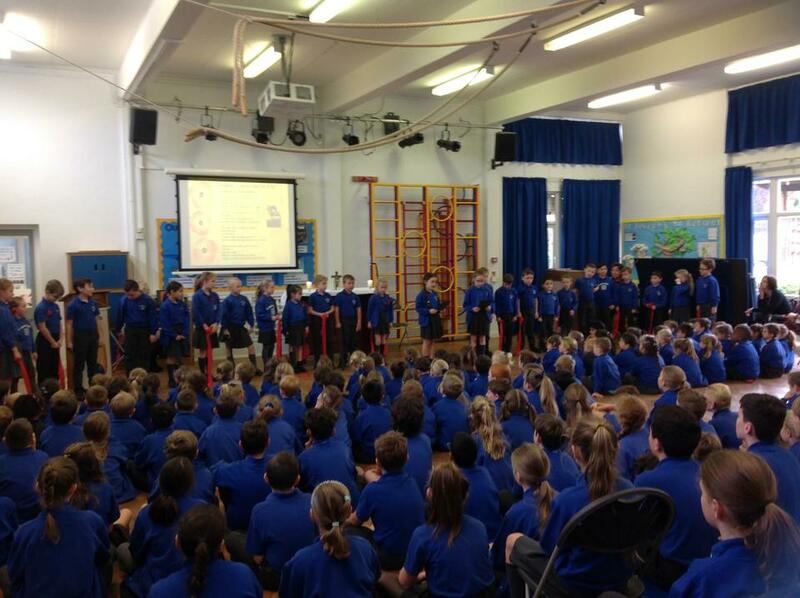 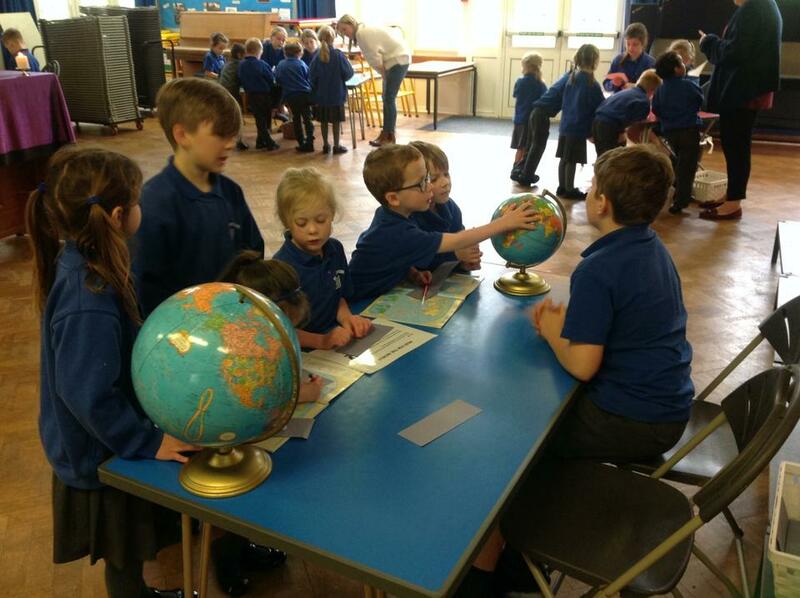 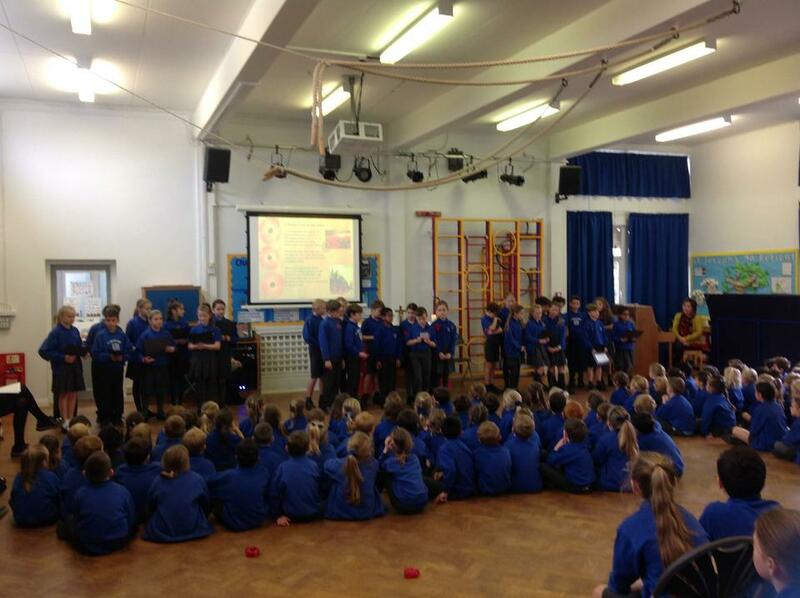 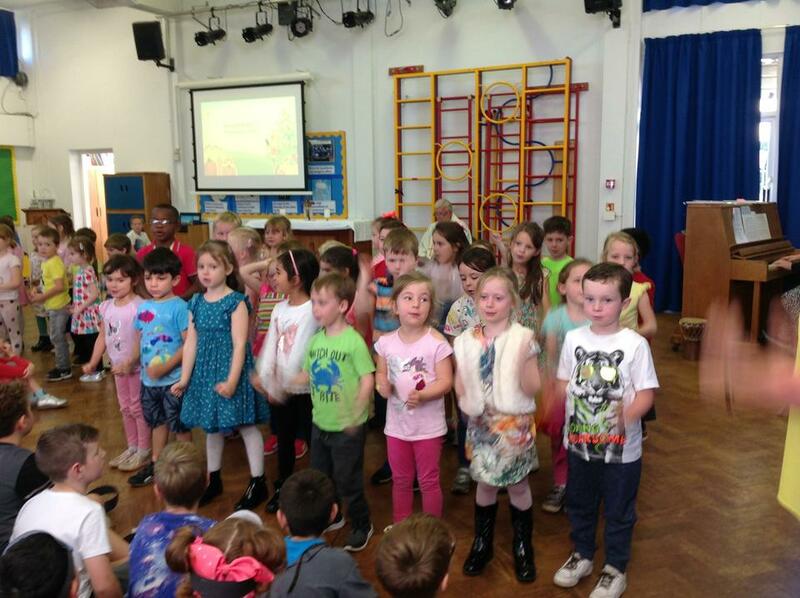 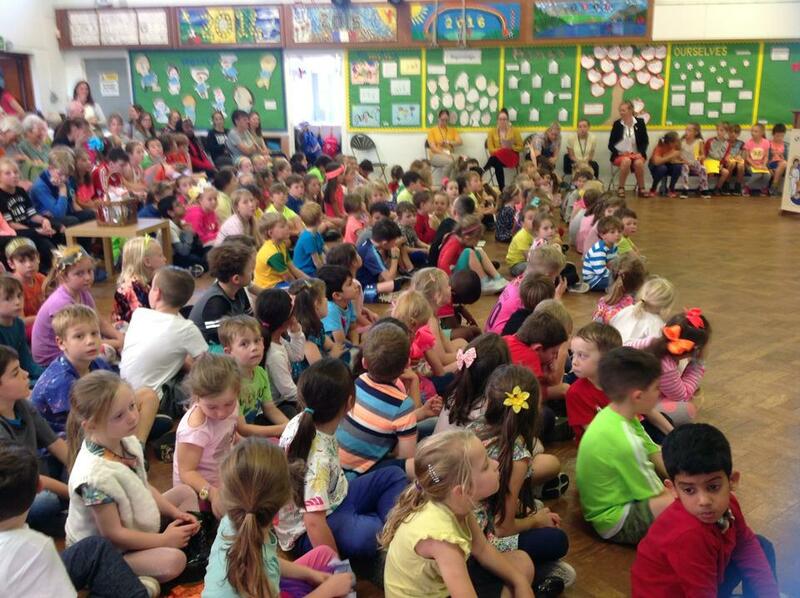 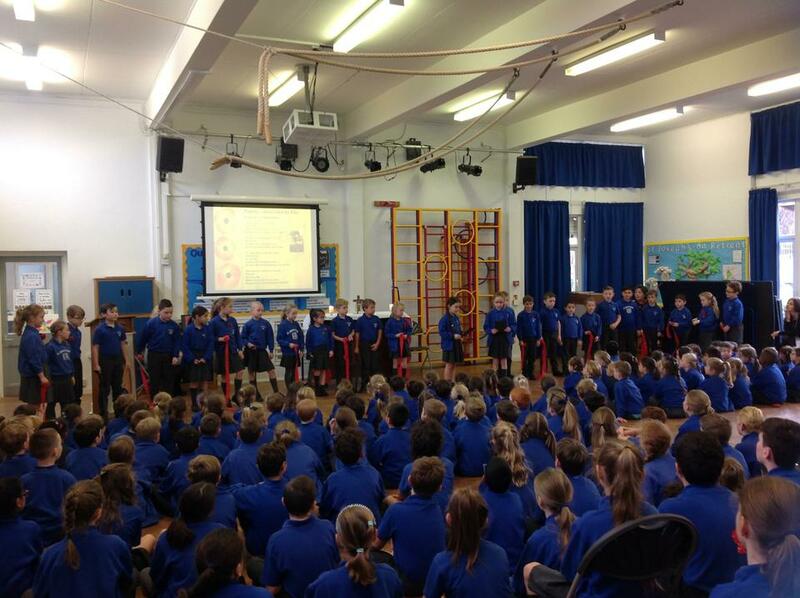 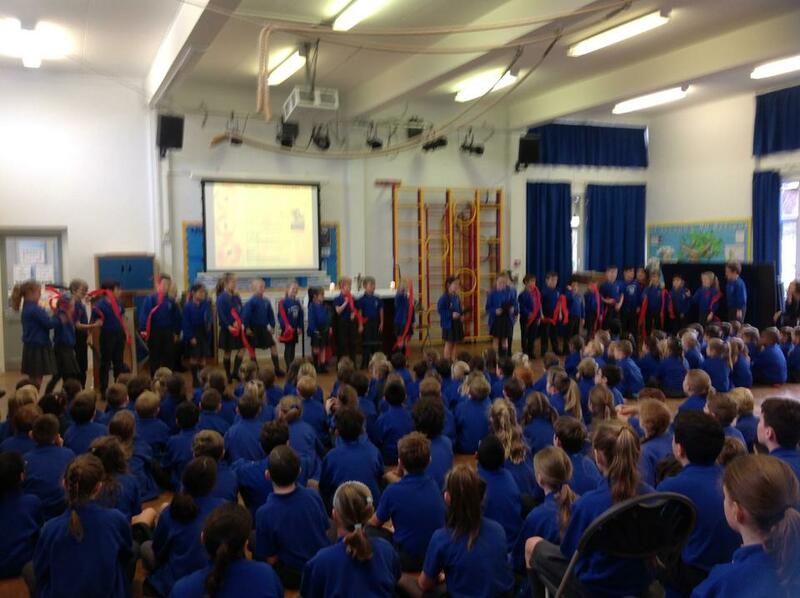 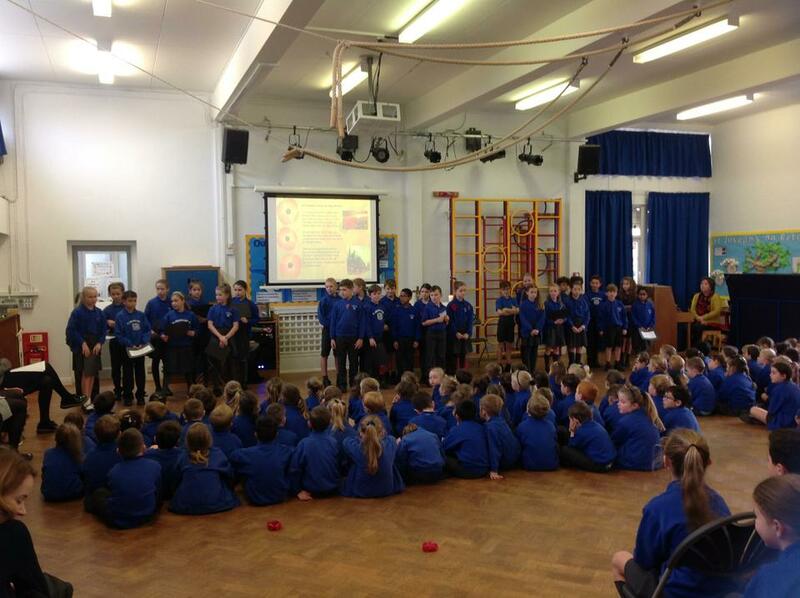 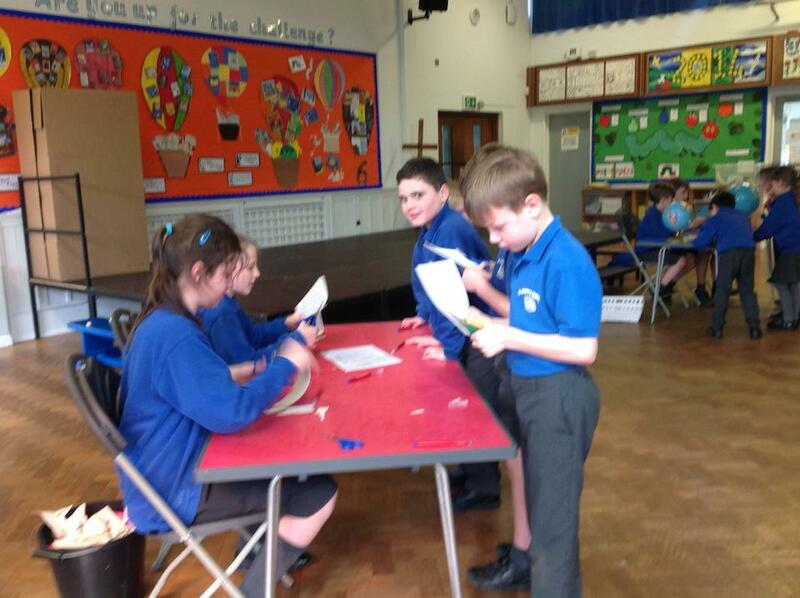 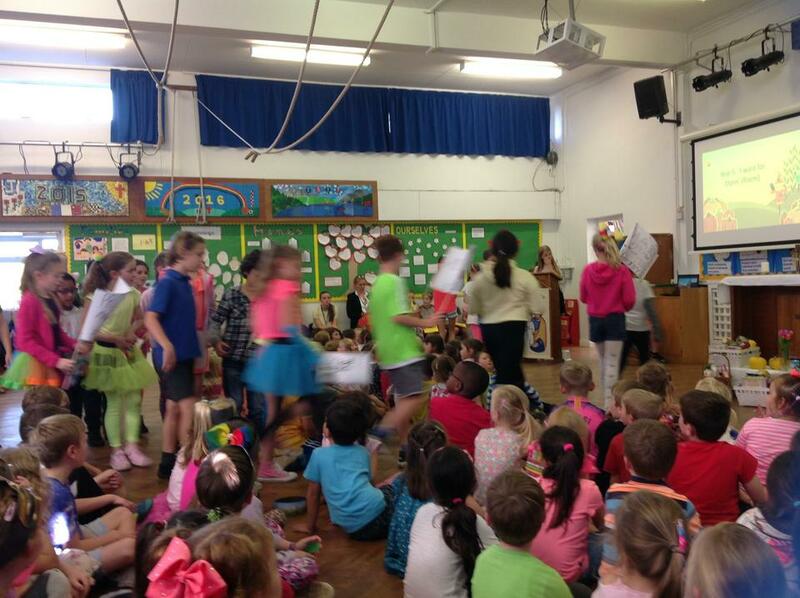 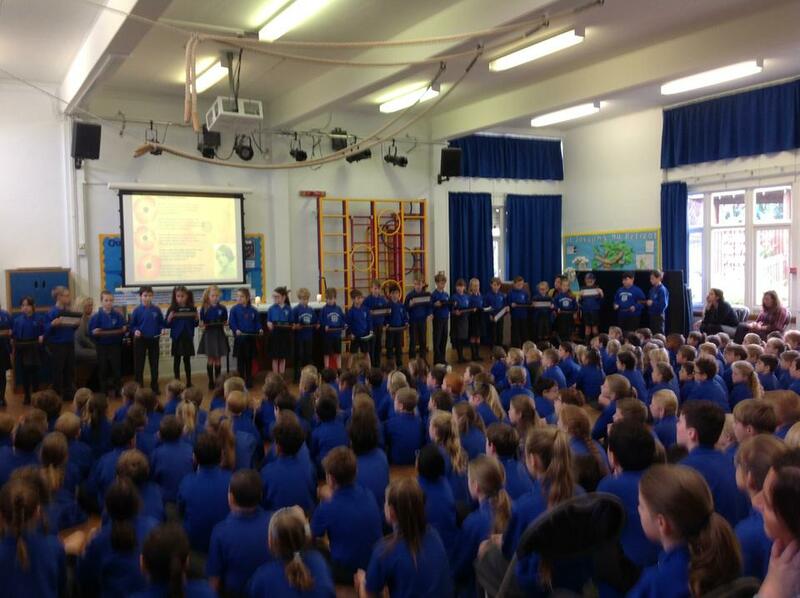 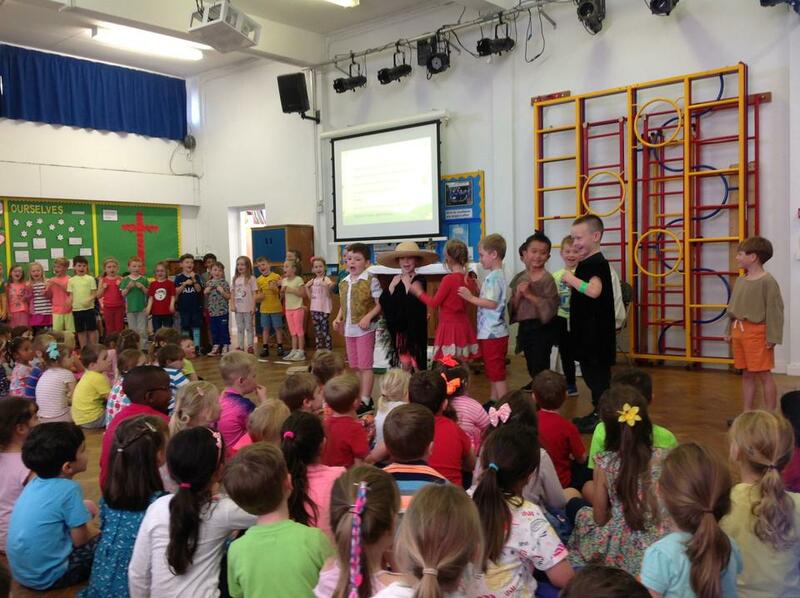 The team did a great job and the children's singing, under the direction of Mrs Kee, was truly wonderful. 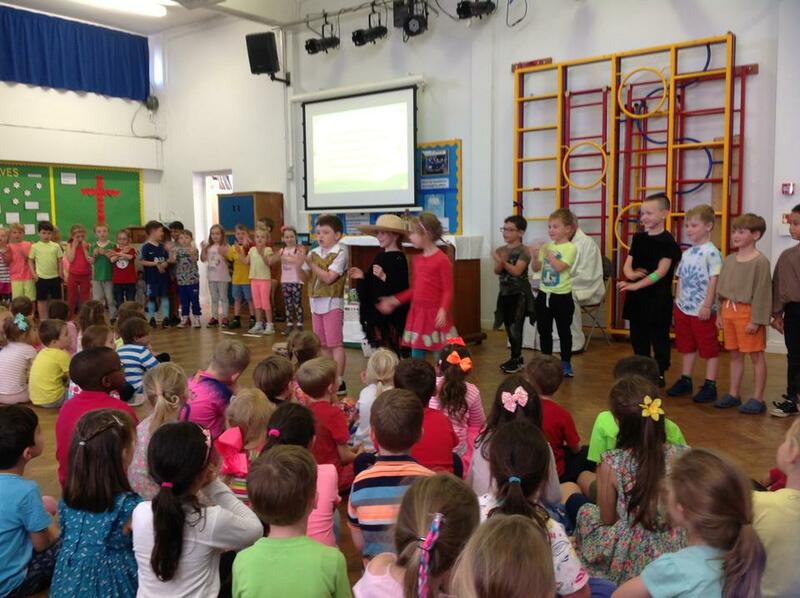 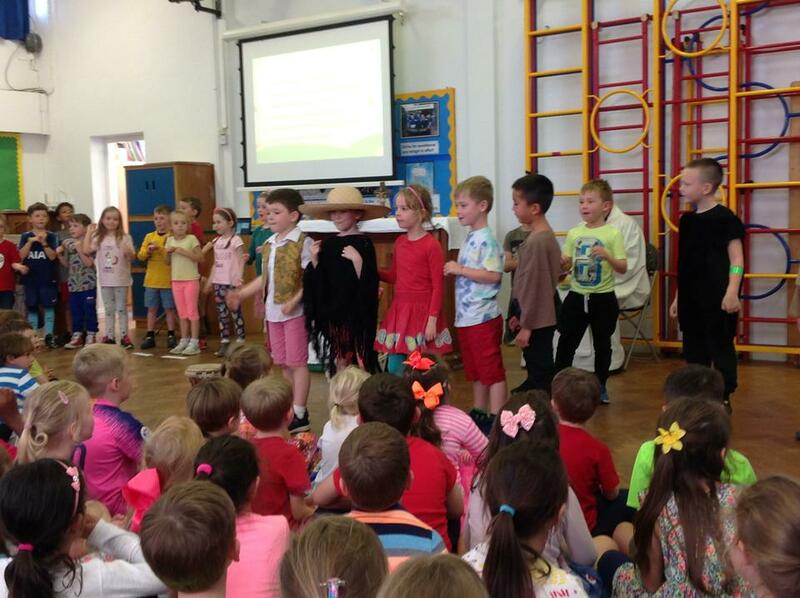 The Foundation Stage and KS1 nativity plays were a joy to watch and the children thoroughly enjoyed being part of the productions telling the Christmas story in a fun but special way. 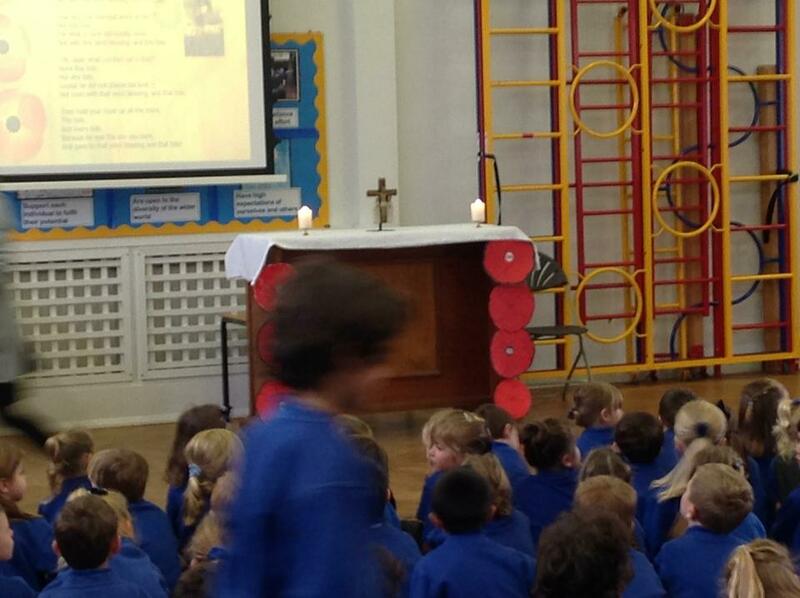 The KS2 Advent Service at the parish church was a truly fitting service to mark this special time in the churches year. 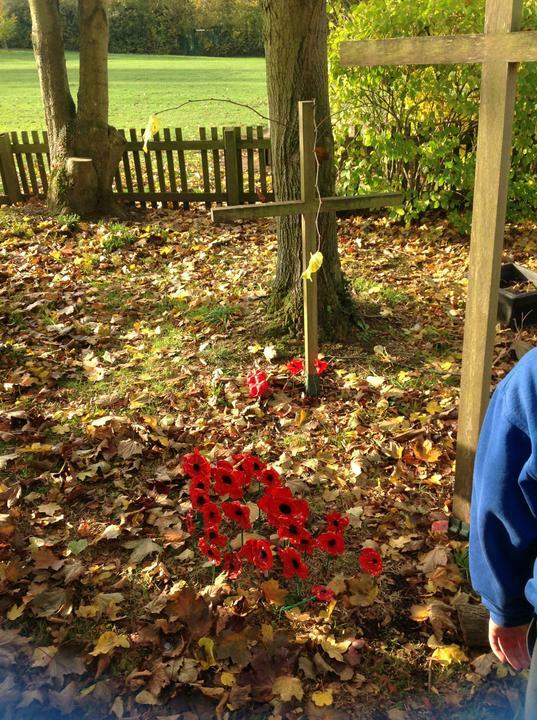 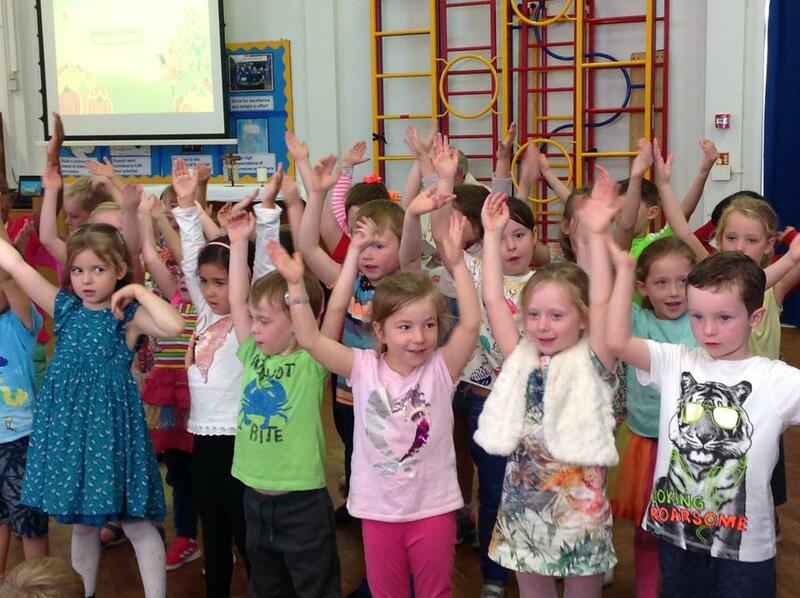 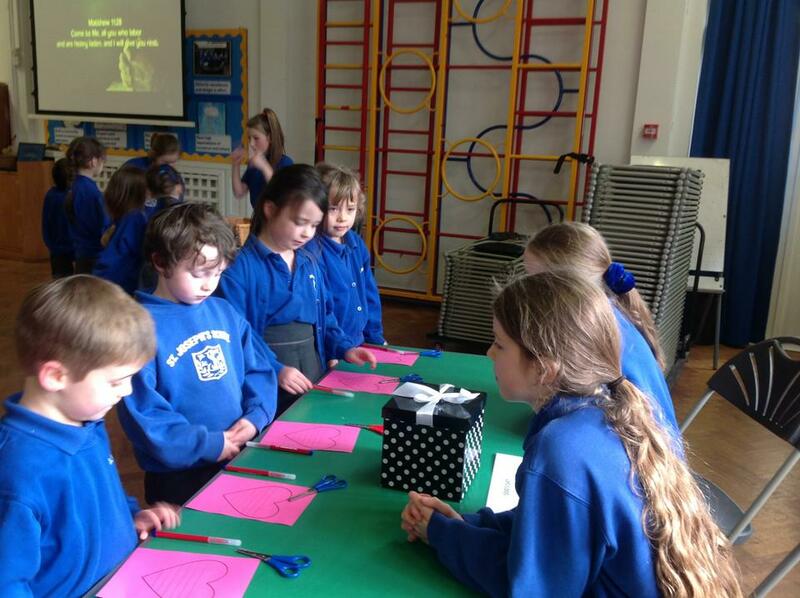 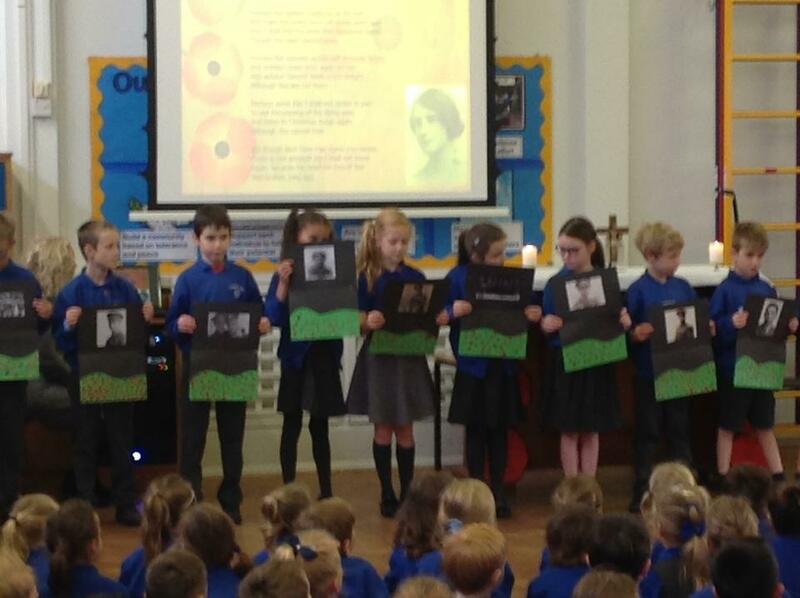 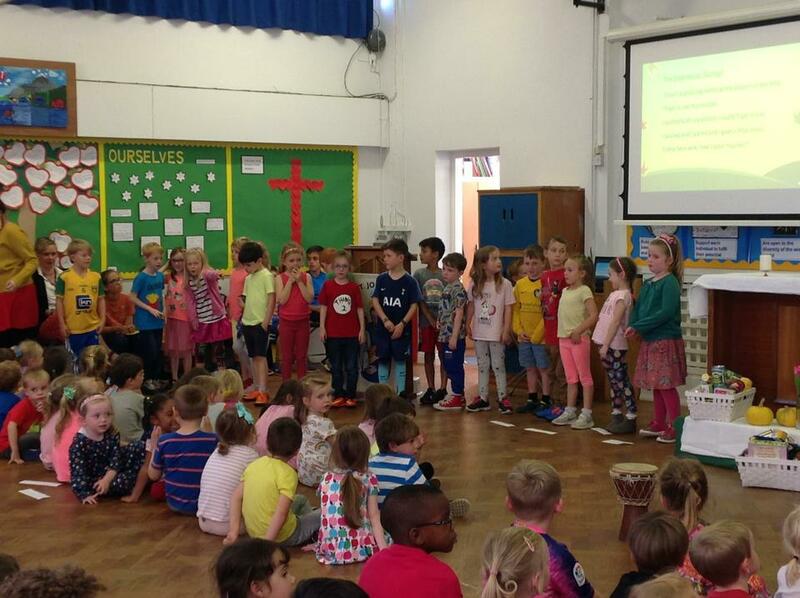 the children expressed themselves through song, dance, prayer and readings. 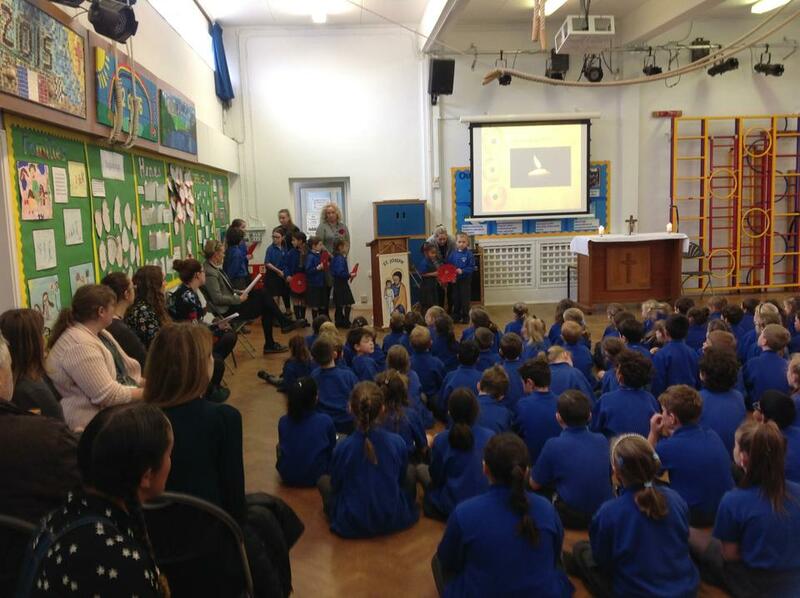 As always it was attended by nearly all families and an appropriate way to begin the Christmas festivities. 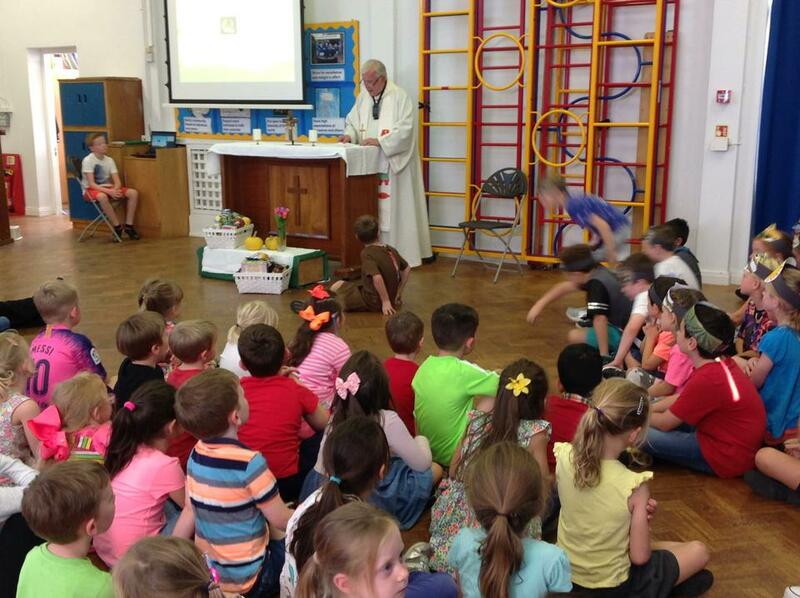 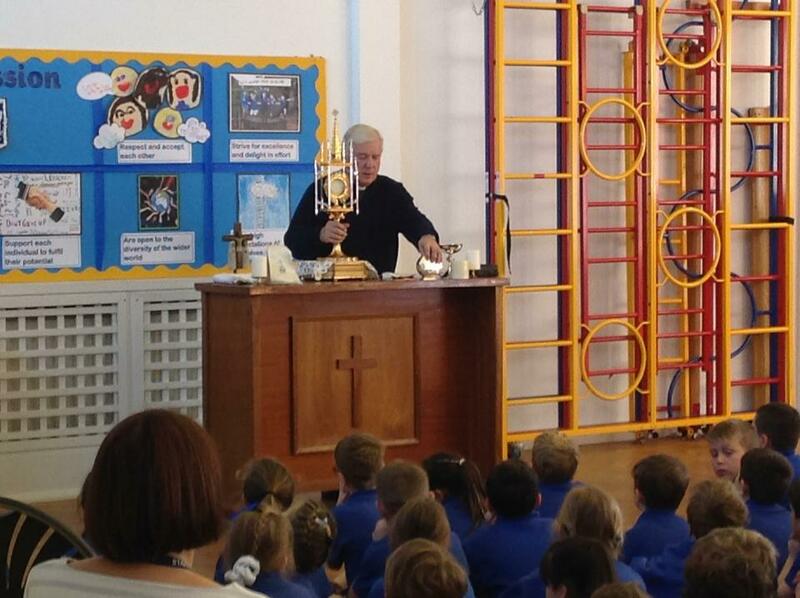 As part of our focus on the Blessed Sacrament and Adoremus Father Terry visited the school to talk to the children about the Blessed Sacrament and Adoration. 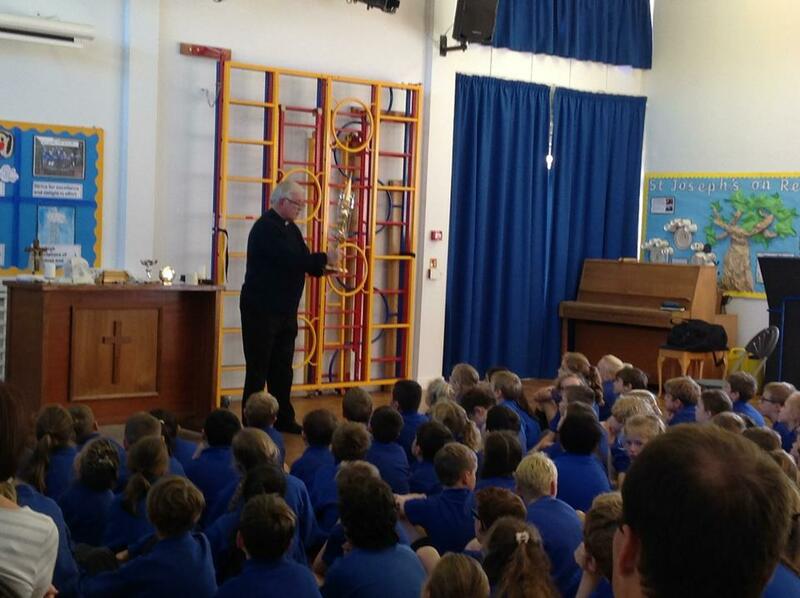 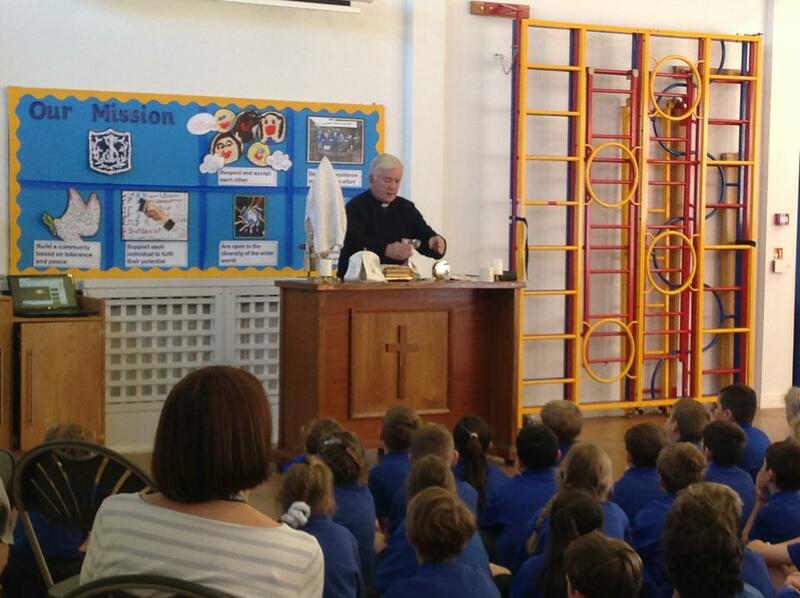 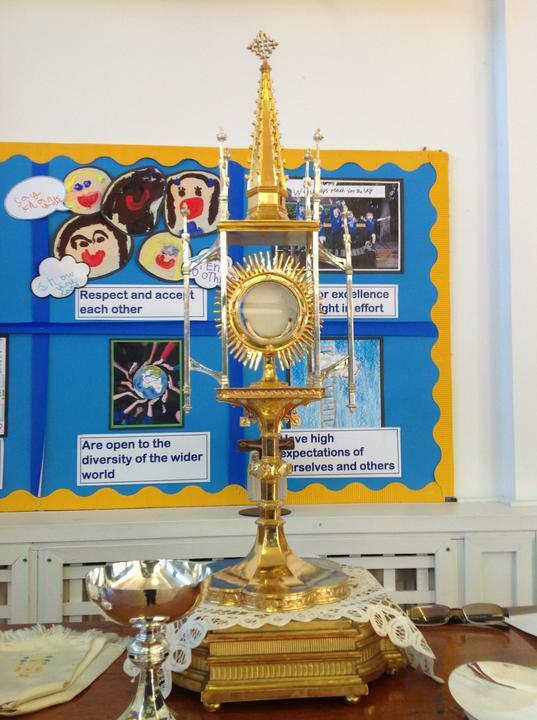 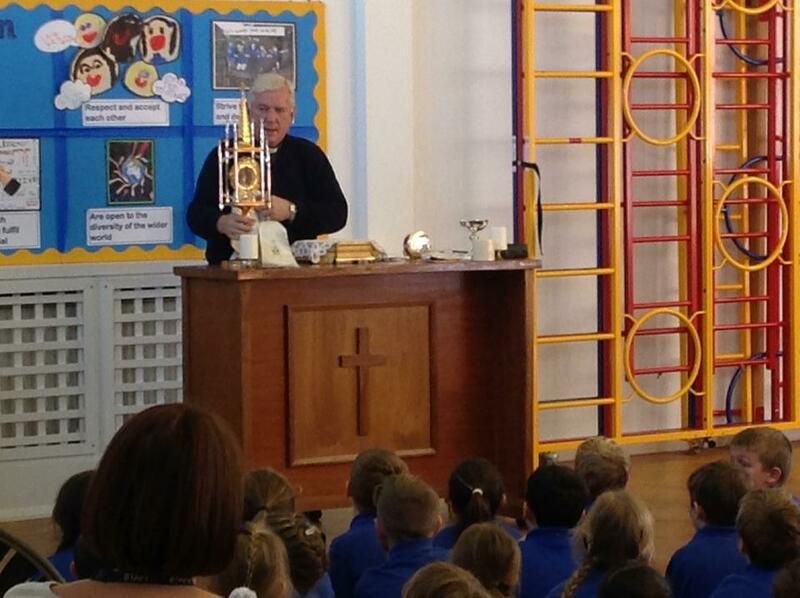 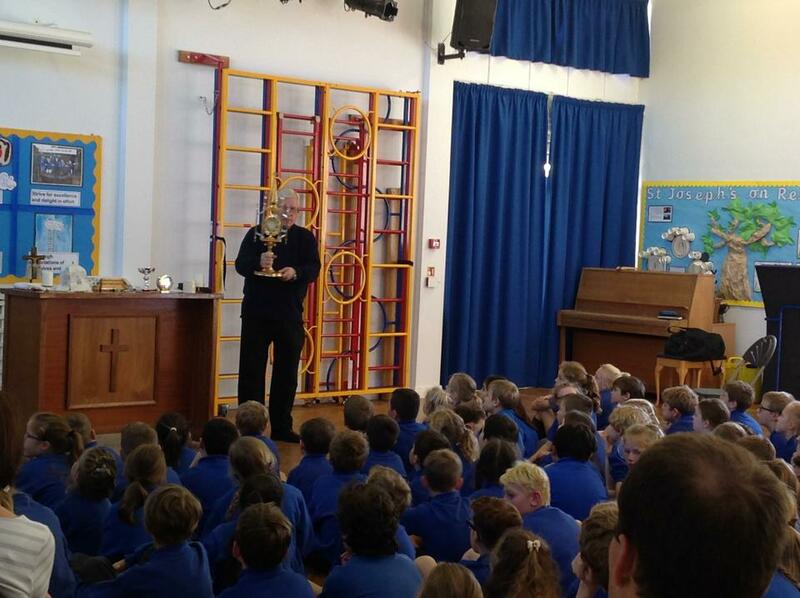 He brought the Monstrance into school and and spoke about the history of Adoration of the Blessed Sacrament. 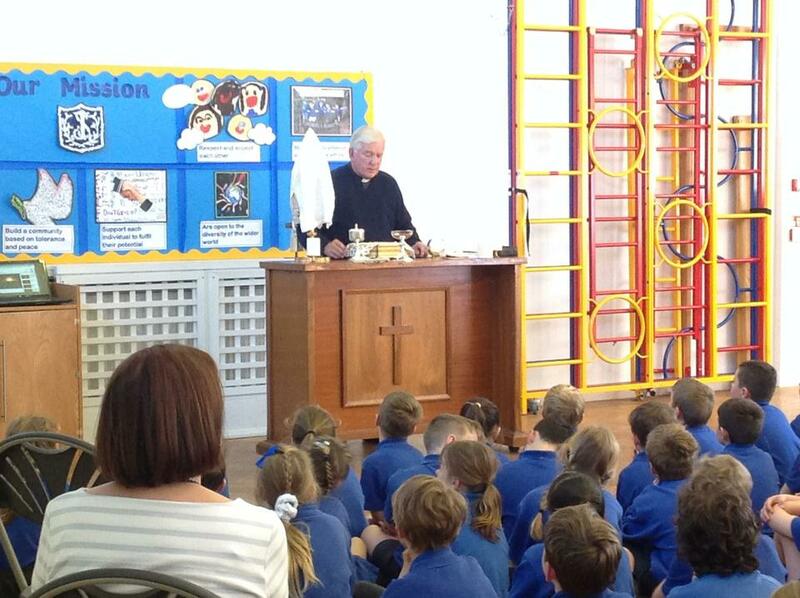 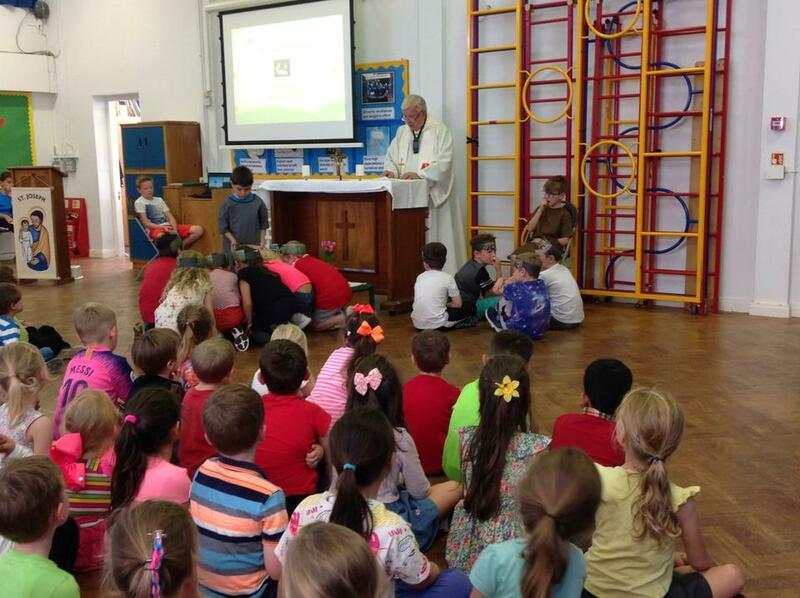 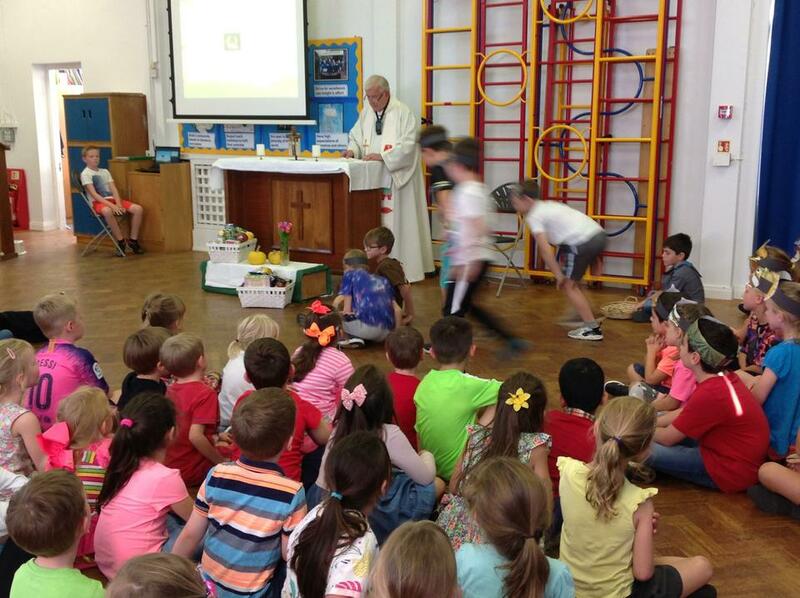 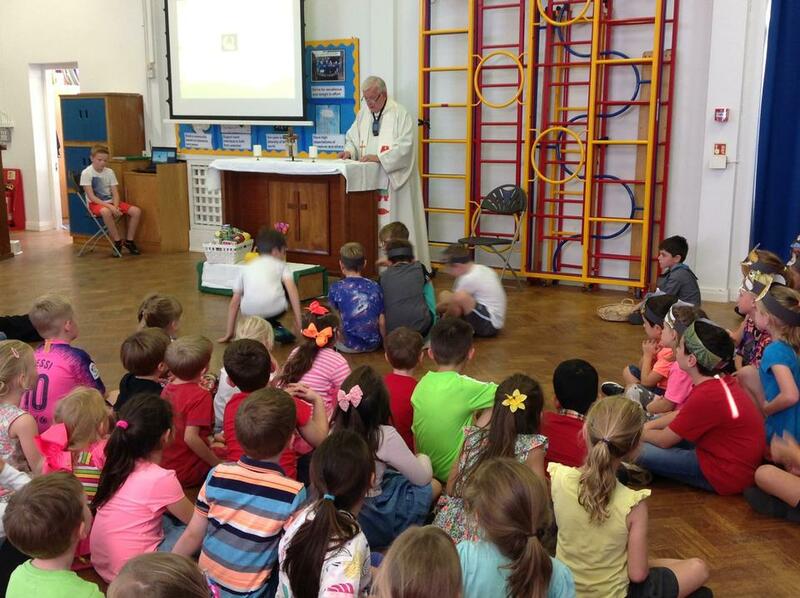 The children were enthralled, Father Terry really brought to life the tradition of Adoration and made it relevant to the children. 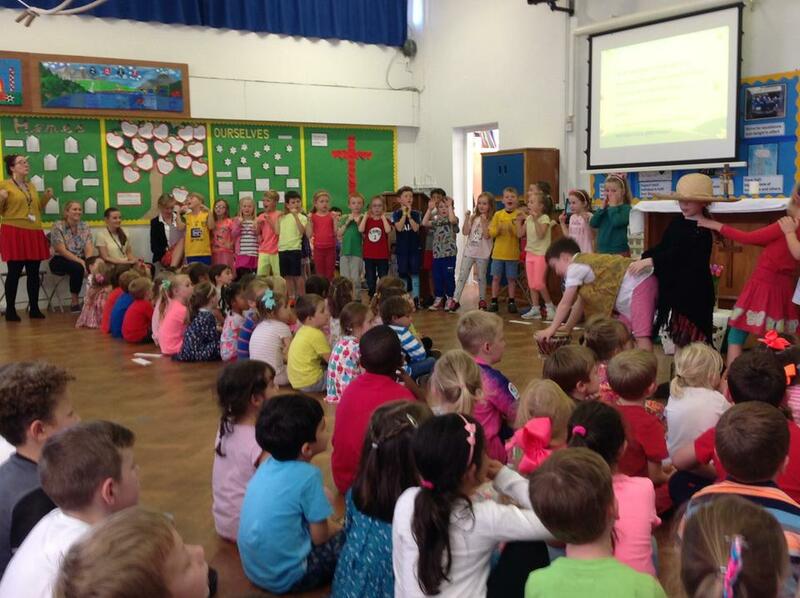 Our Harvest celebration was very well attended, we had to bring in extra chairs as it was standing room only at the back. 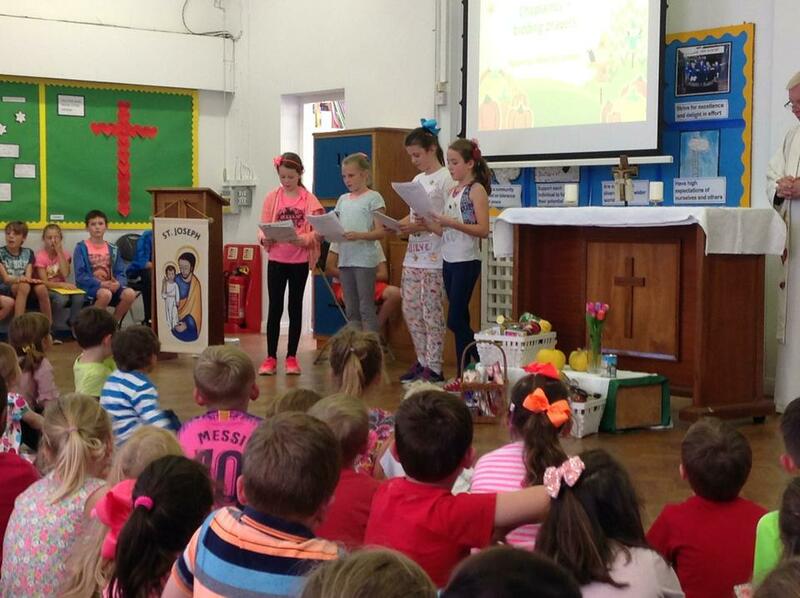 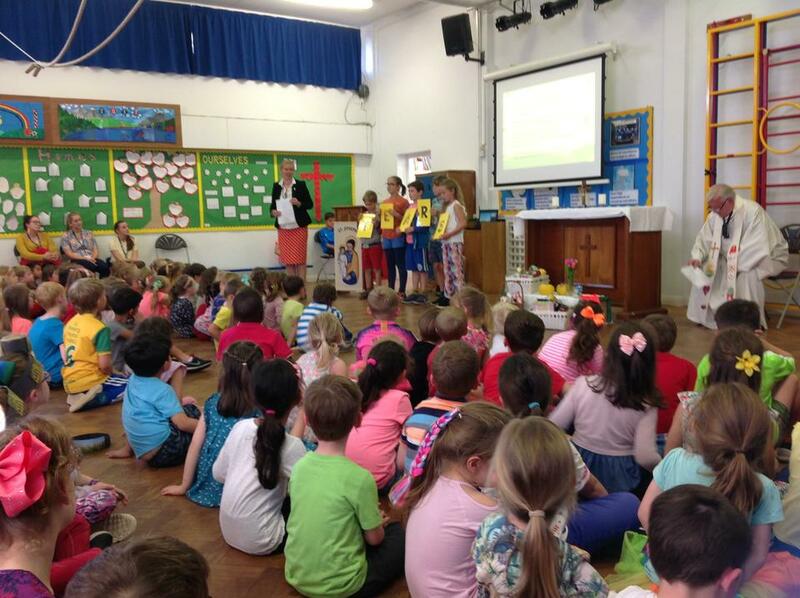 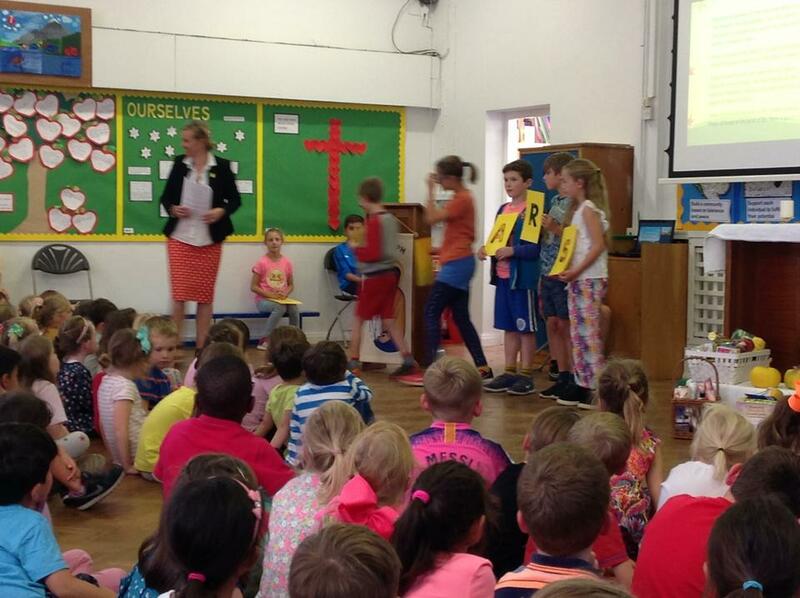 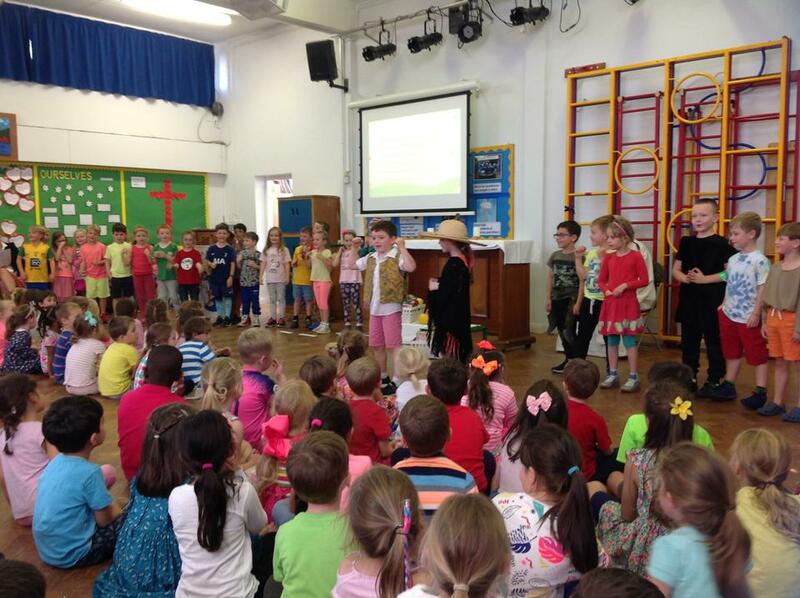 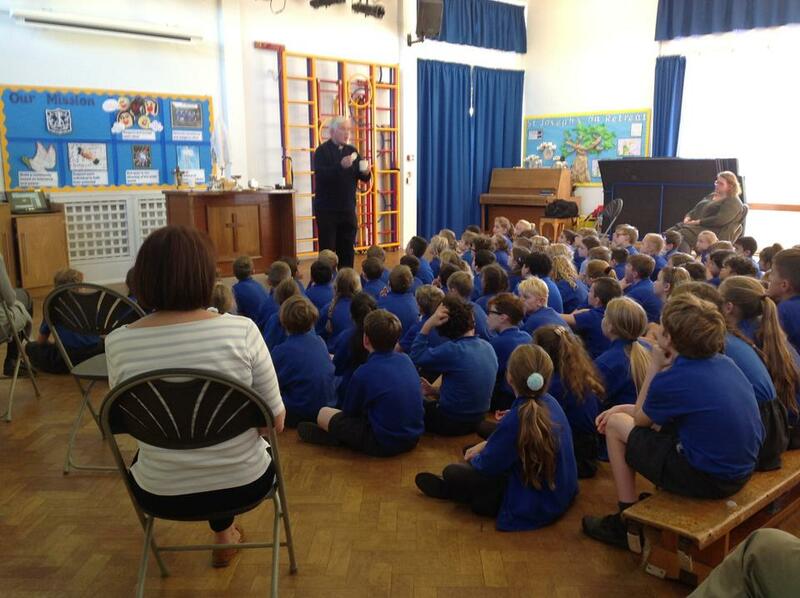 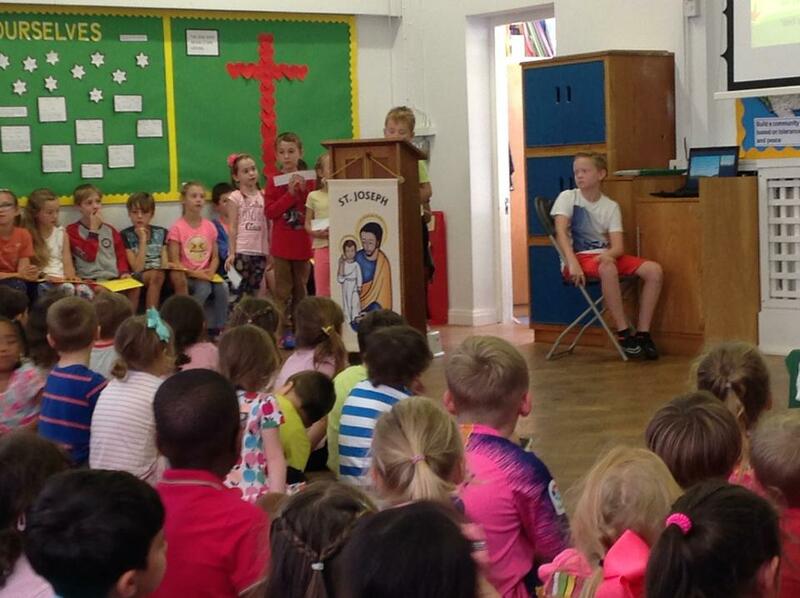 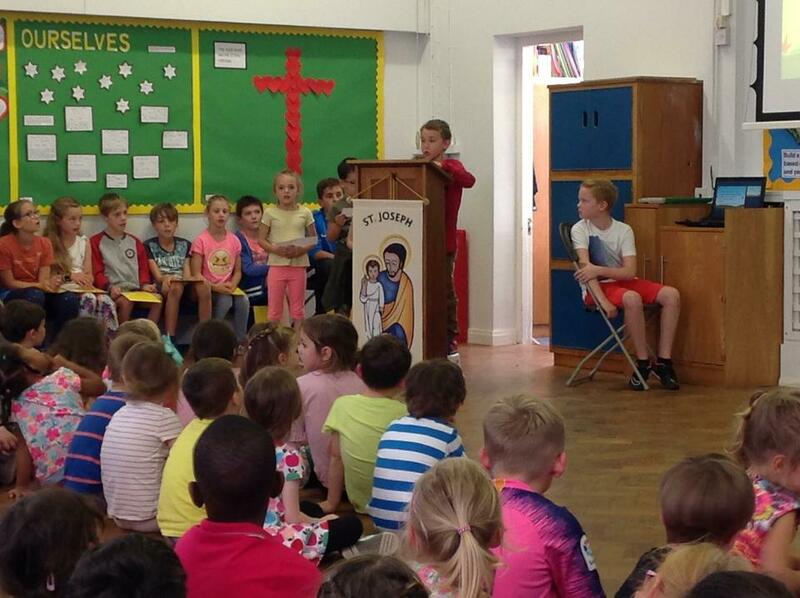 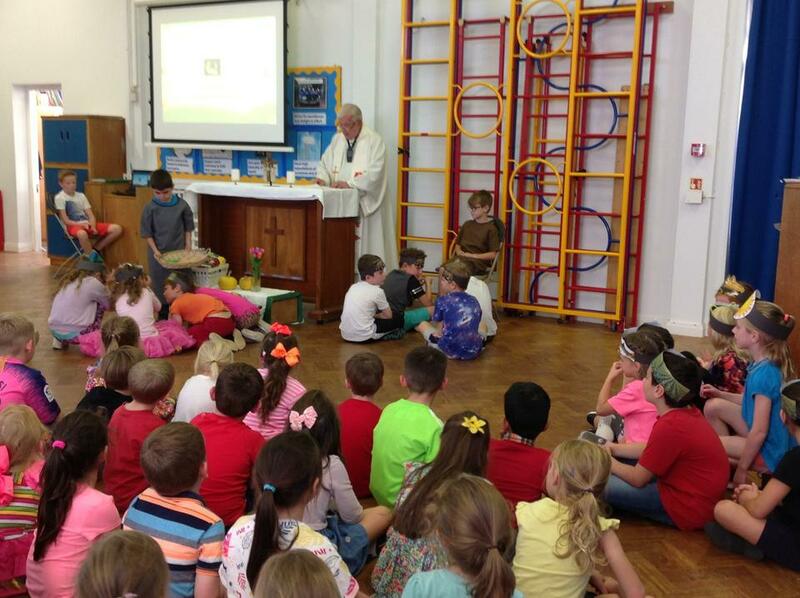 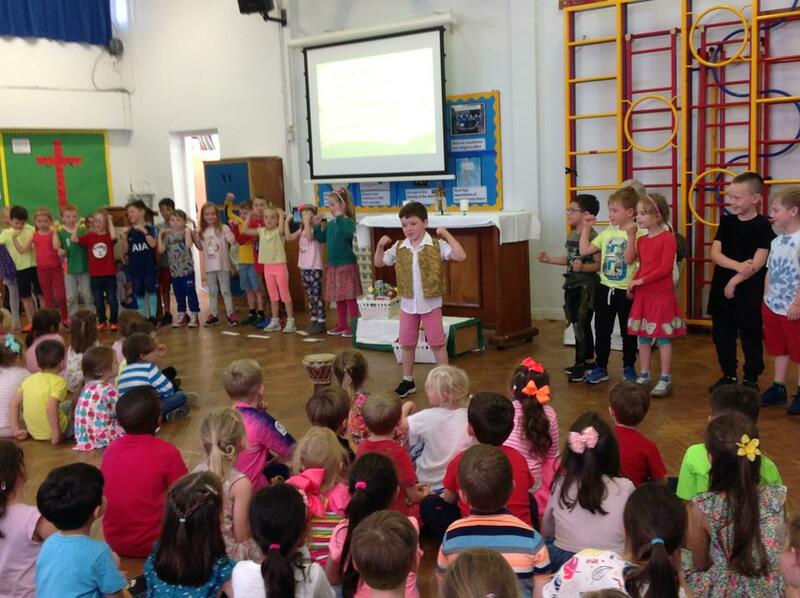 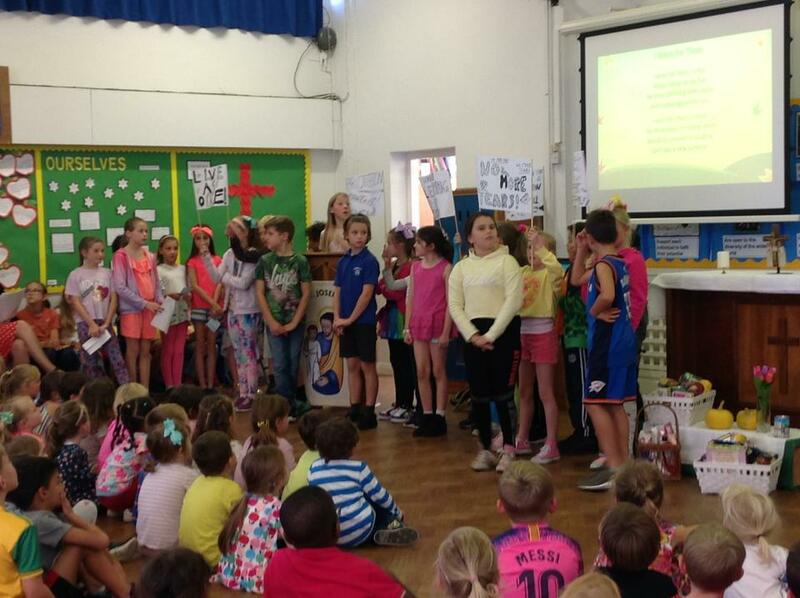 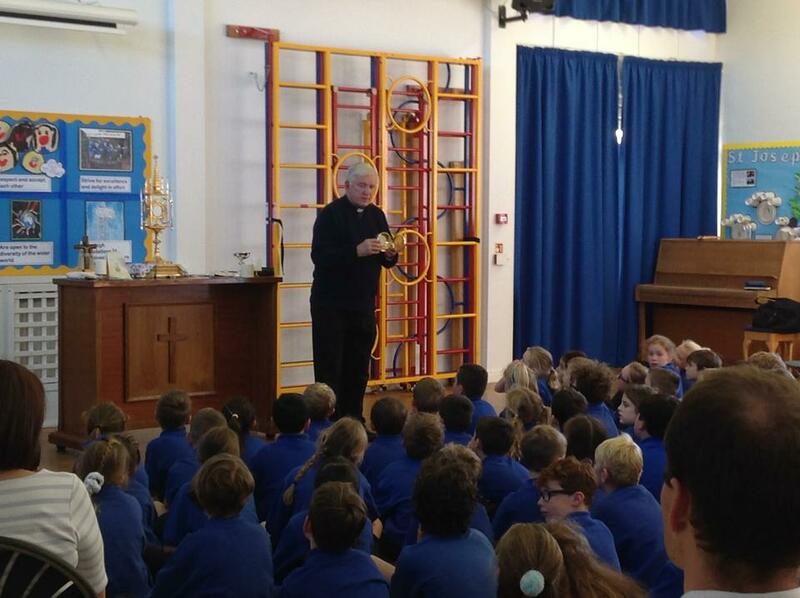 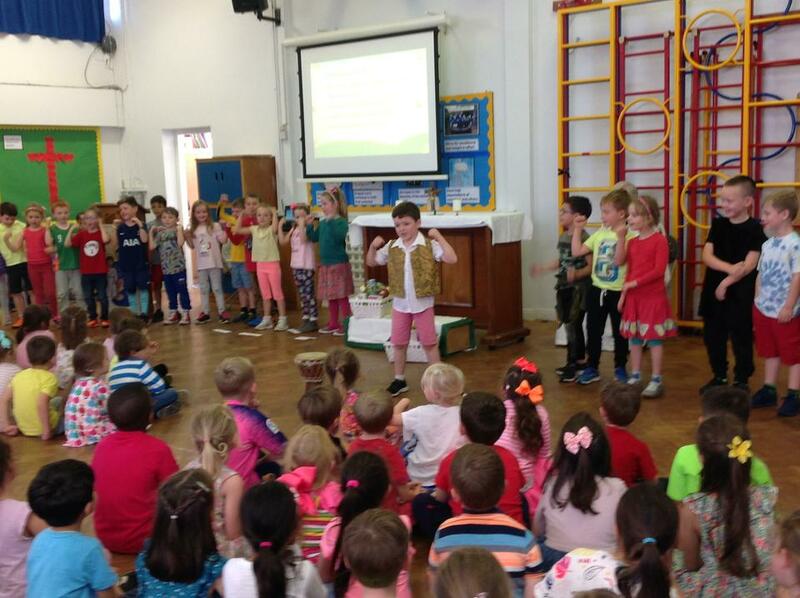 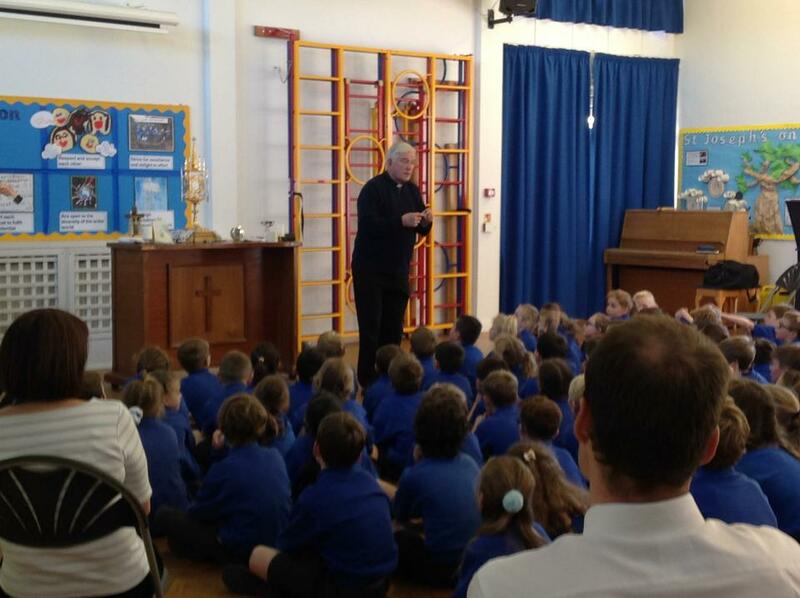 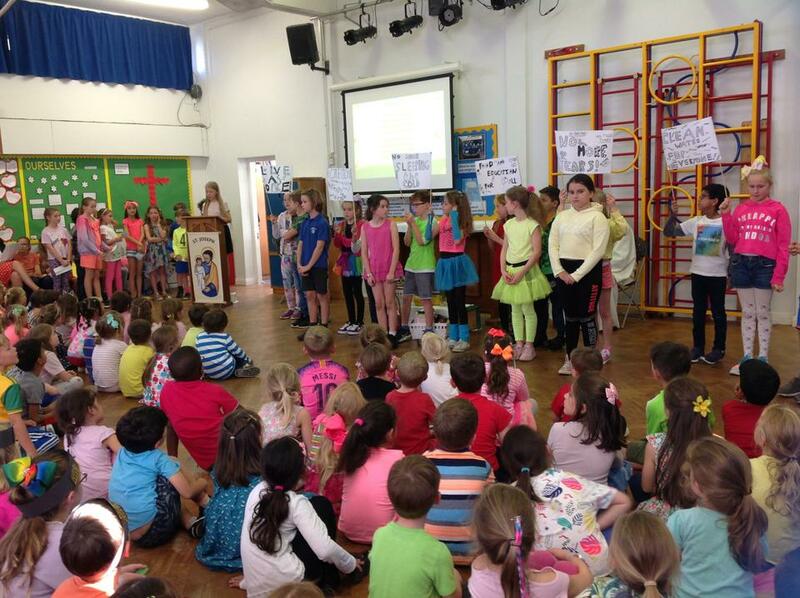 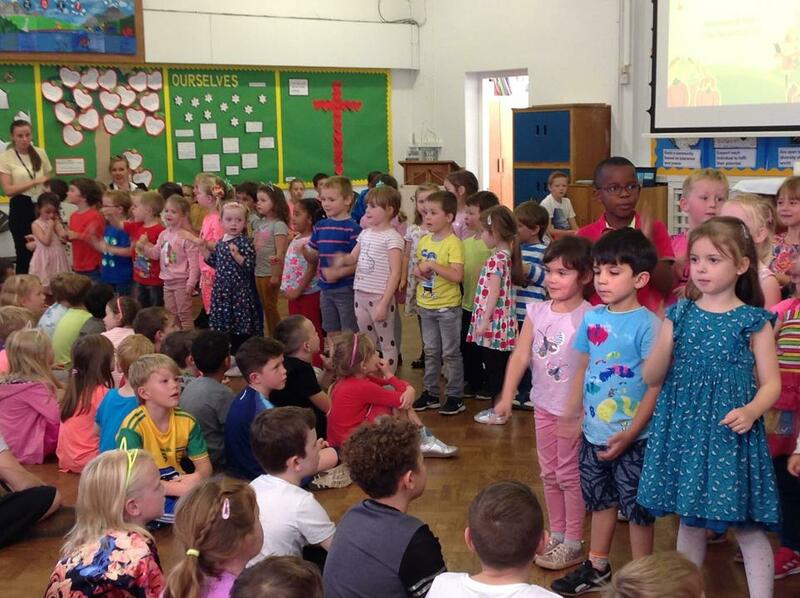 Father Terry led a prayerful service filled with bright colours, drama, reflection and song. 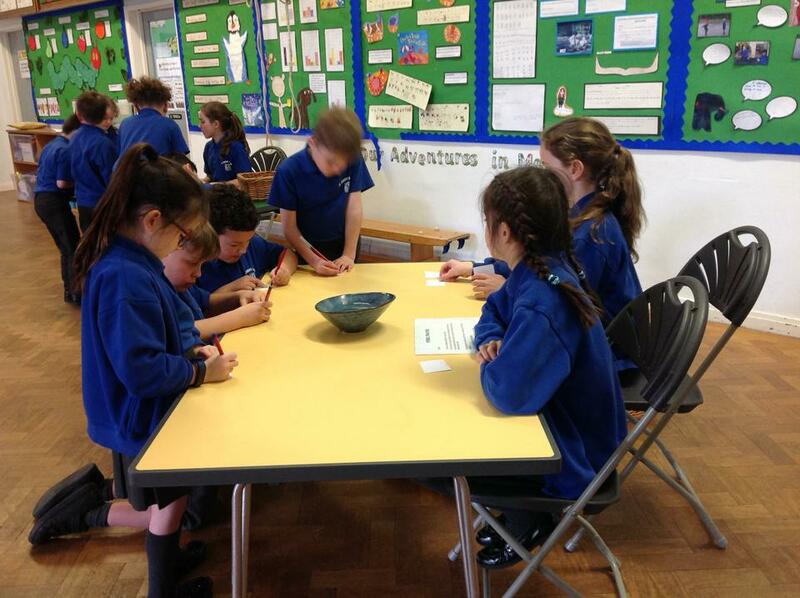 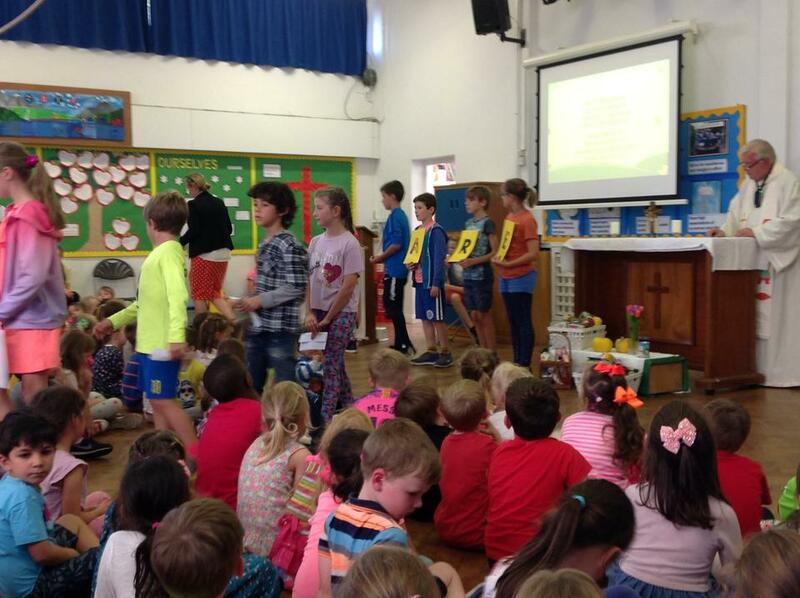 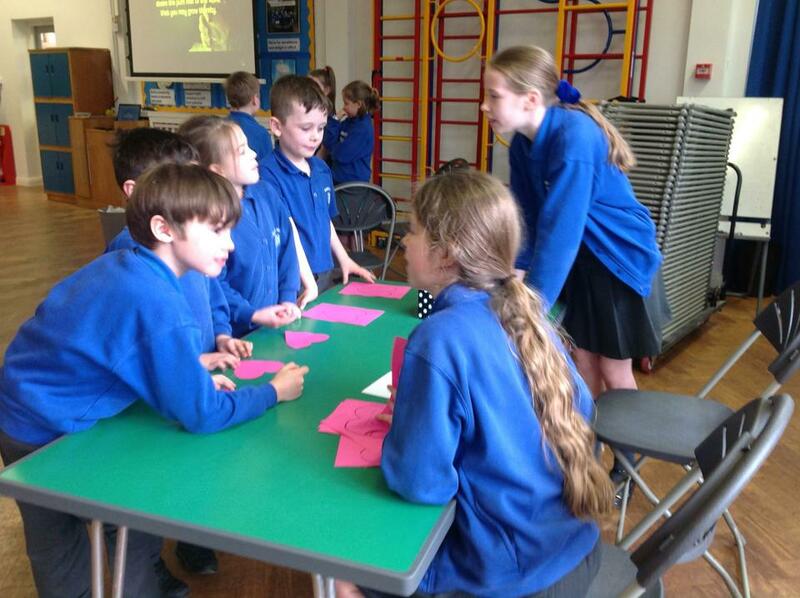 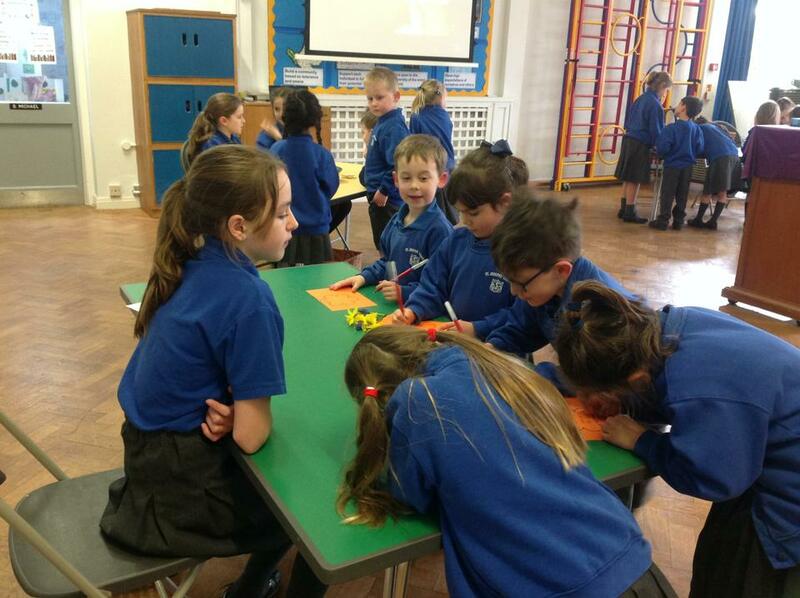 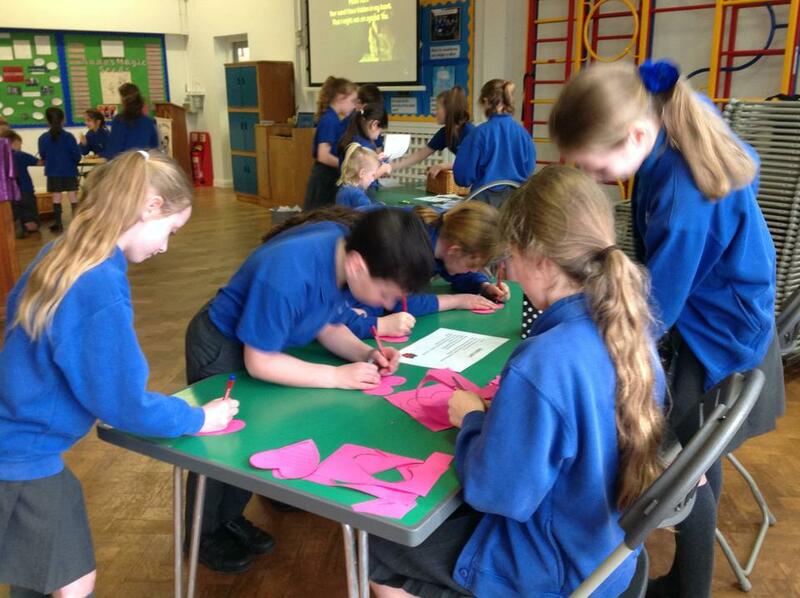 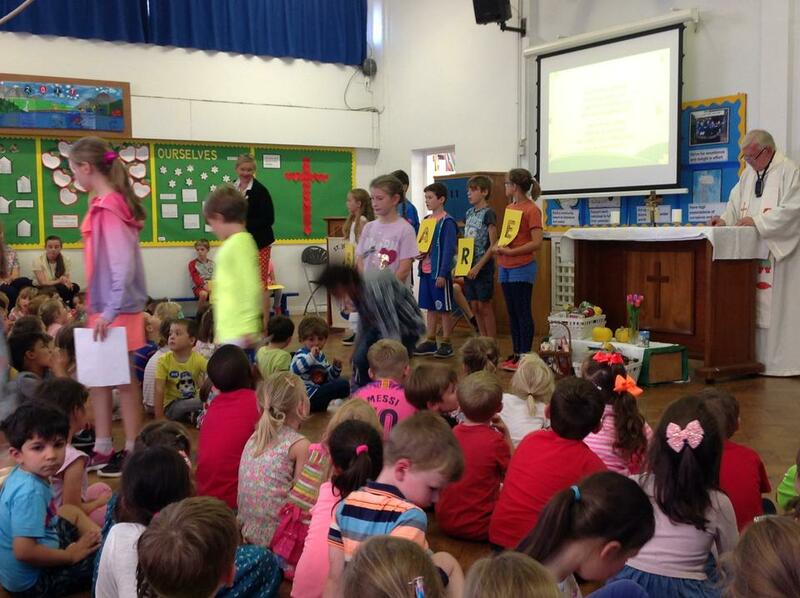 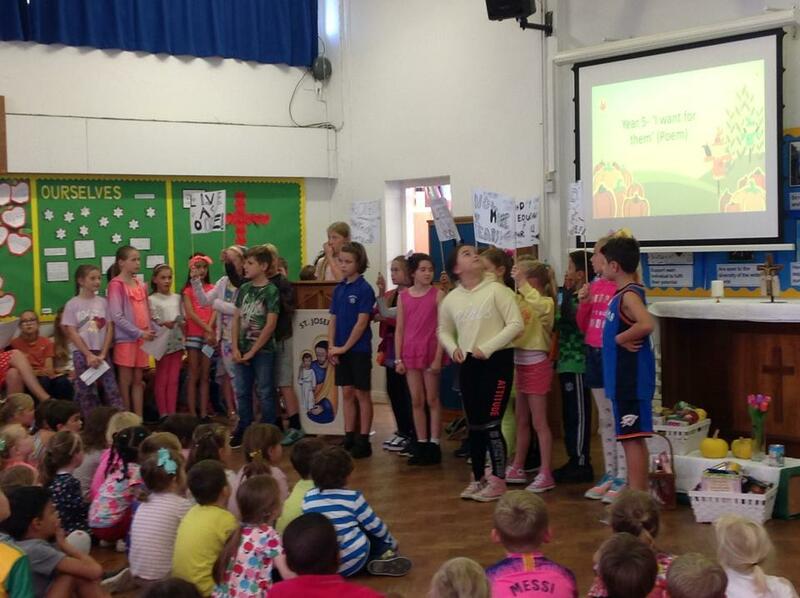 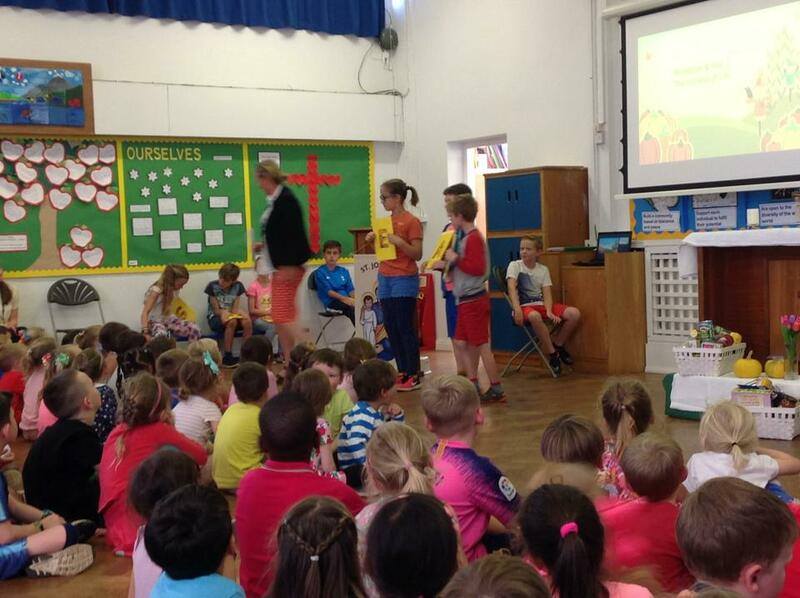 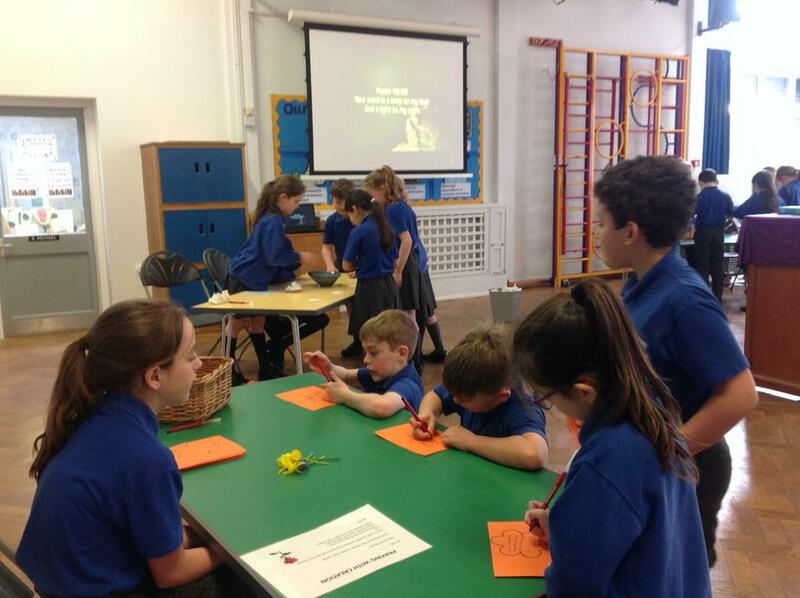 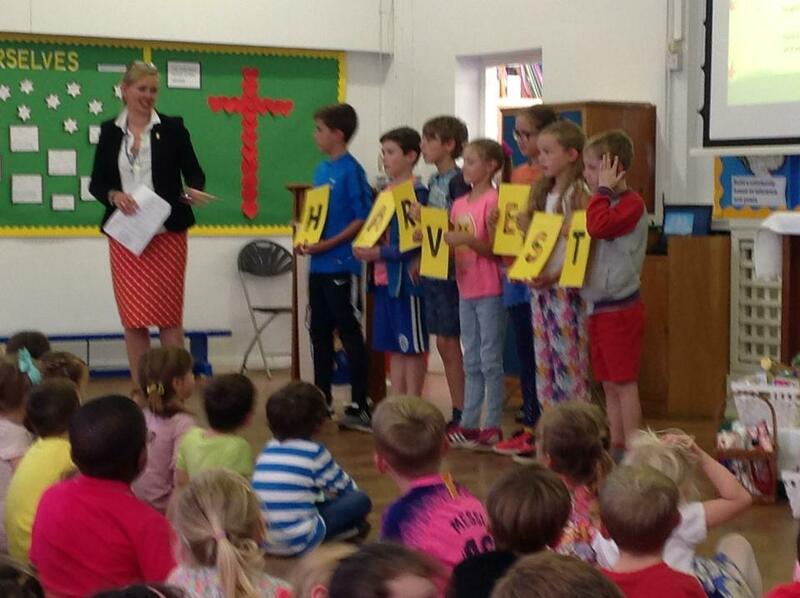 The chaplaincy team were inspired by the CAFOD website to take action and 'Brighten up for Harvest'. 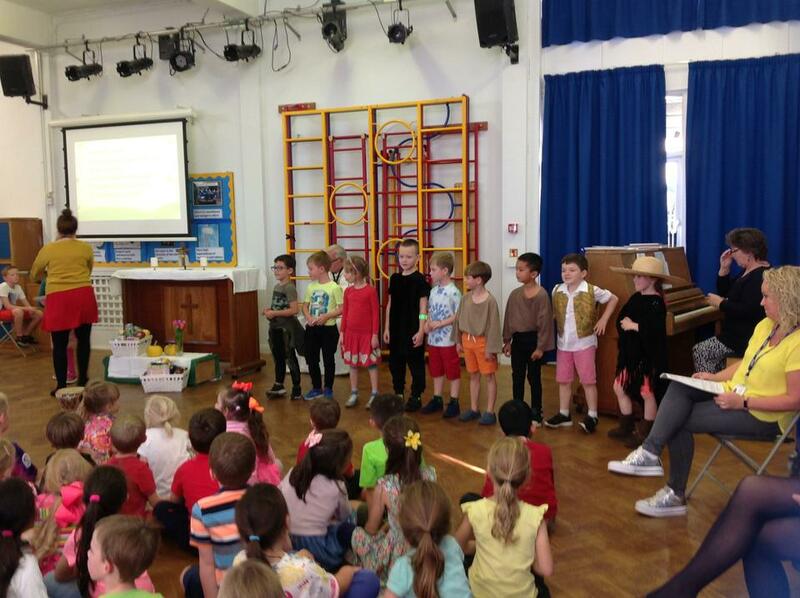 They decided to support our local charity, the Hertford Foodbank. 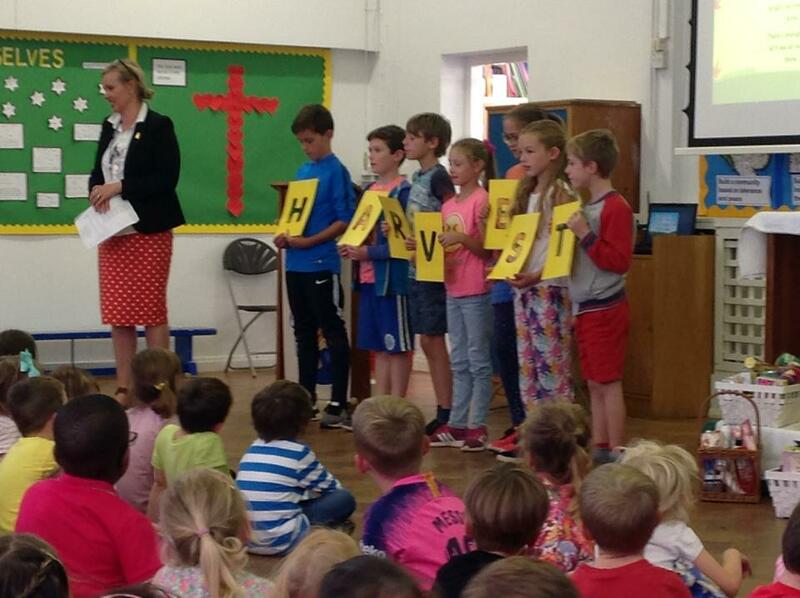 Why are we 'Brightening up Harvest'? 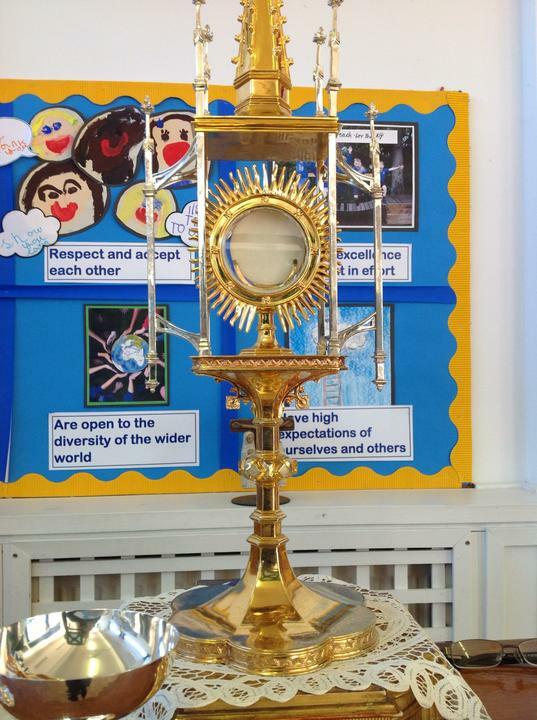 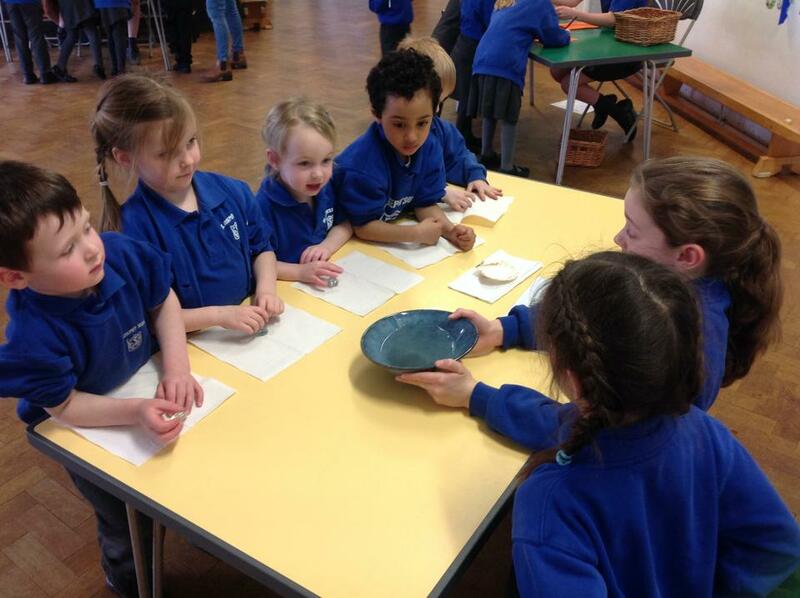 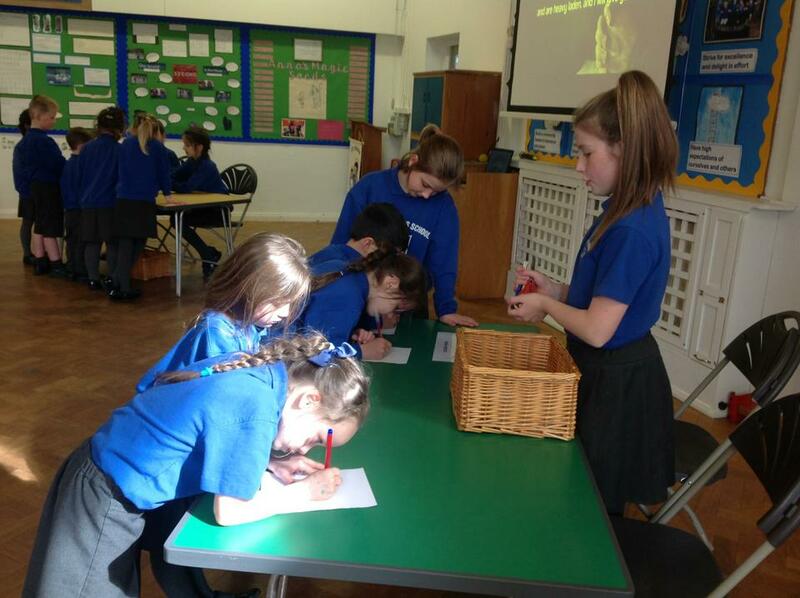 As part of our Adoremus celebrations the whole school have been reflecting on Eucharistic art. 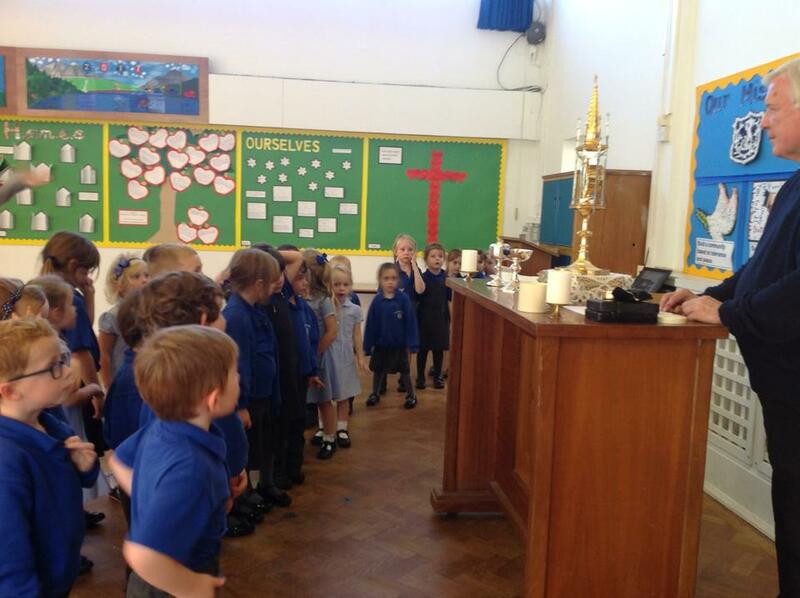 Year 1 children responded to 'Cast Your Nets on the Right Side' by Greg Olsen by discussing how Jesus shared a meal with his disciples. 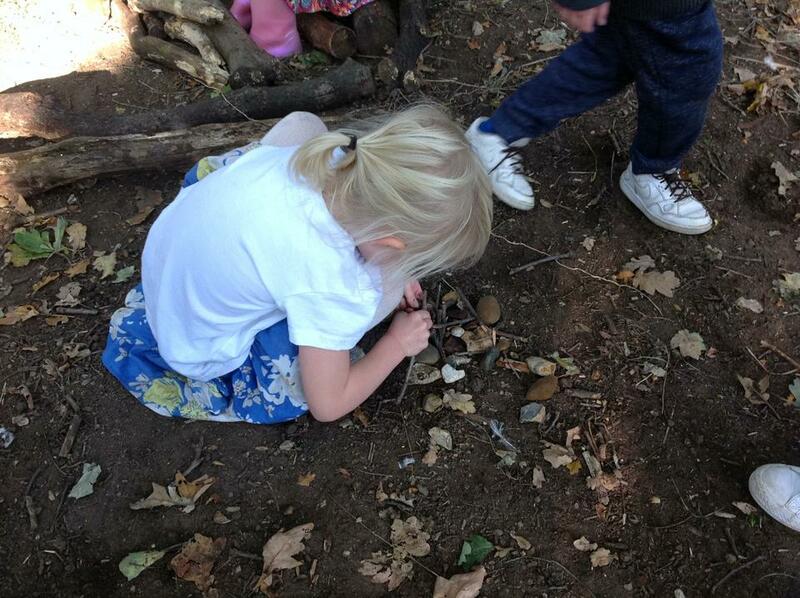 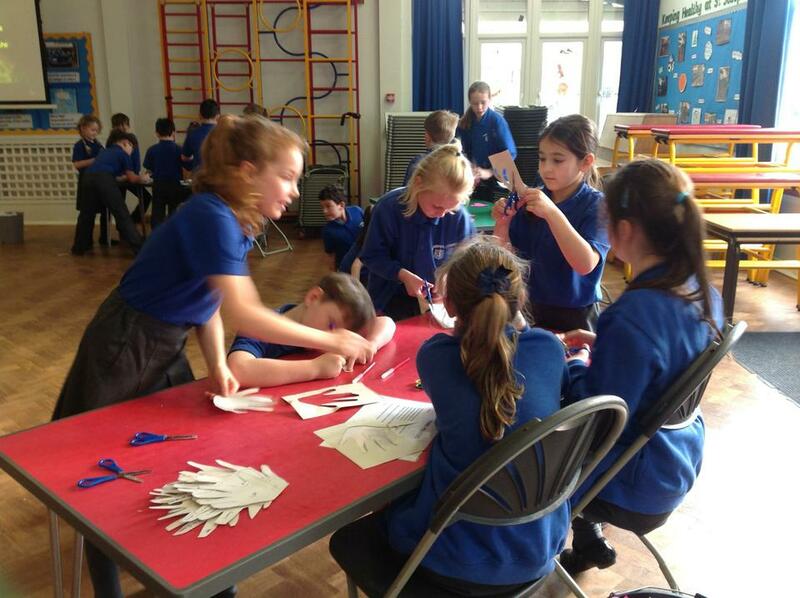 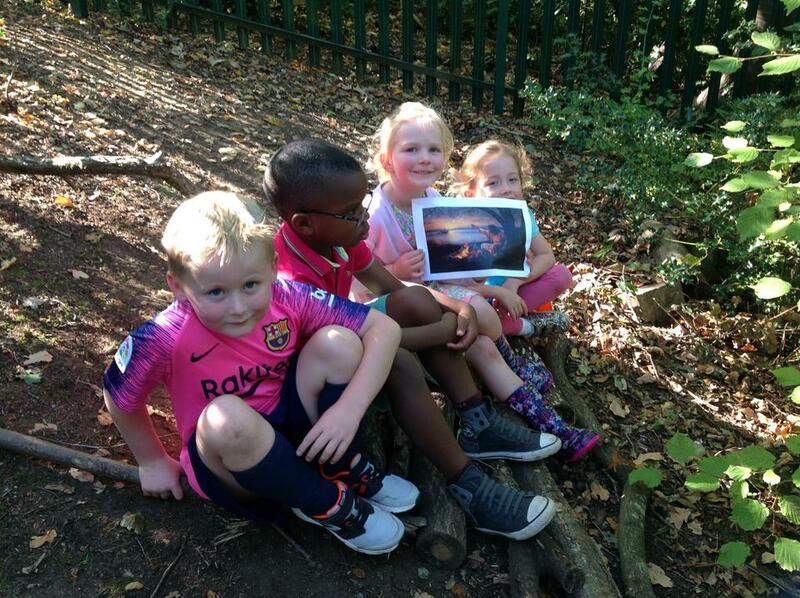 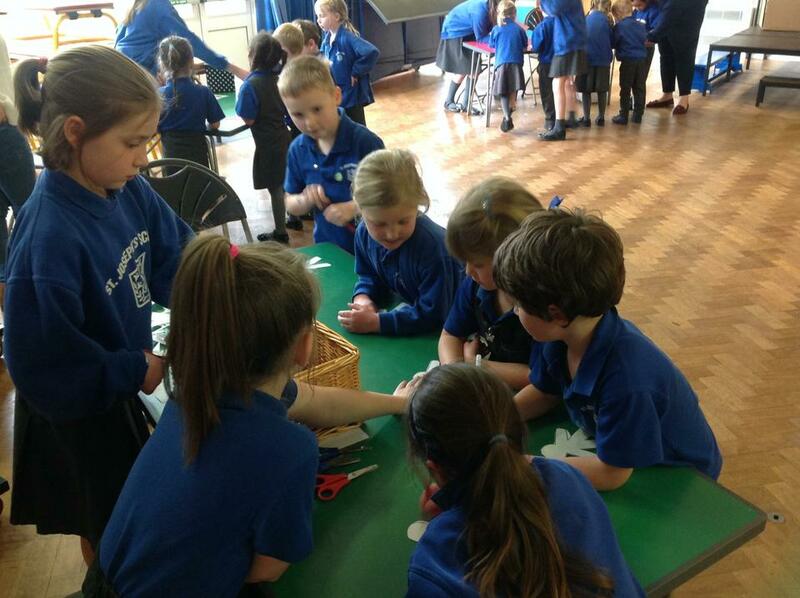 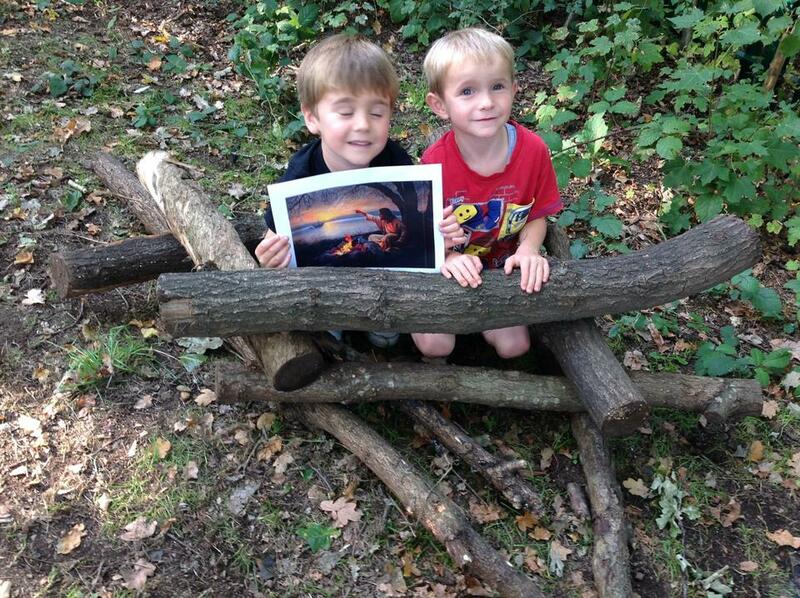 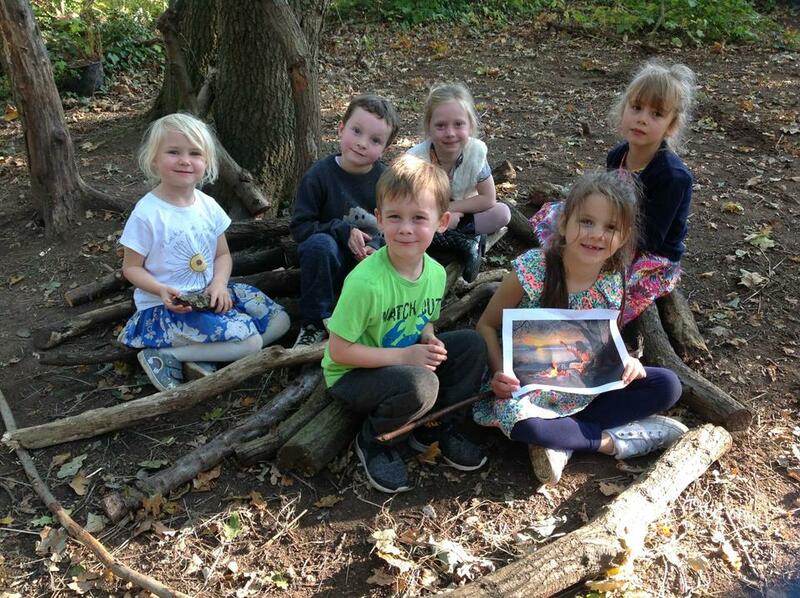 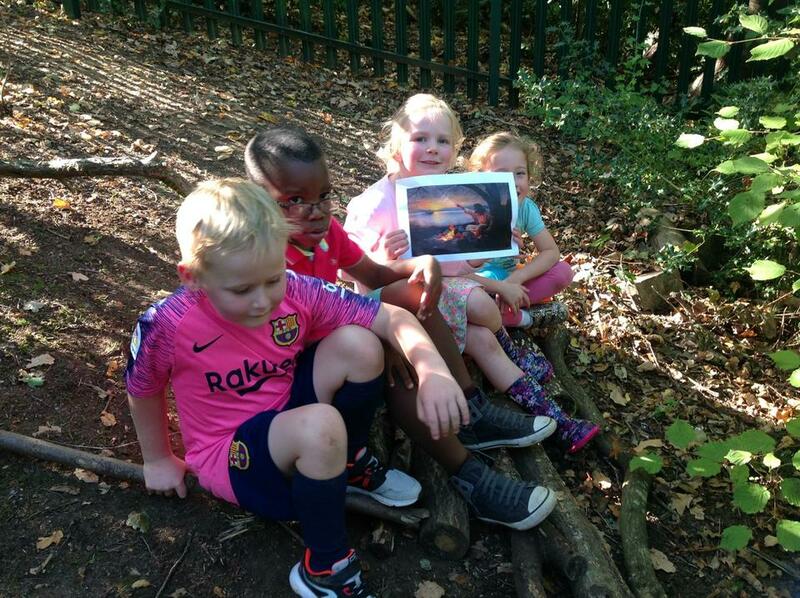 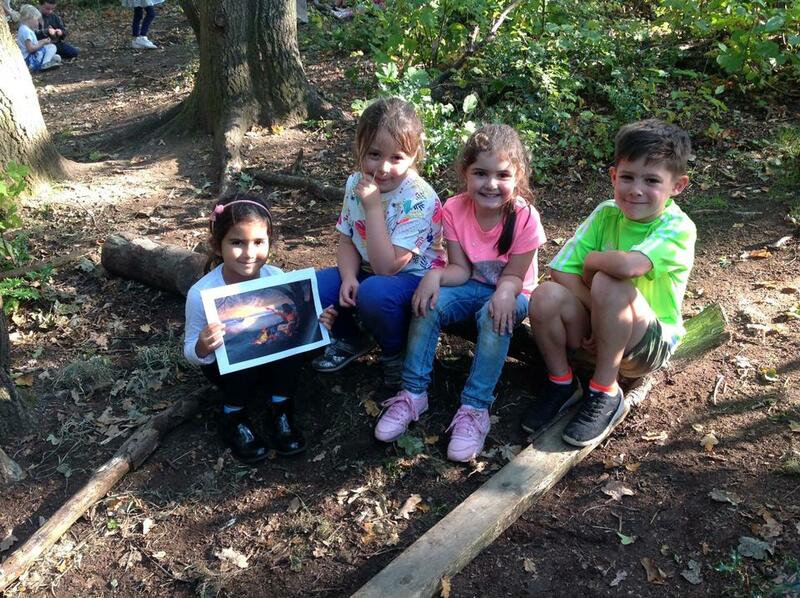 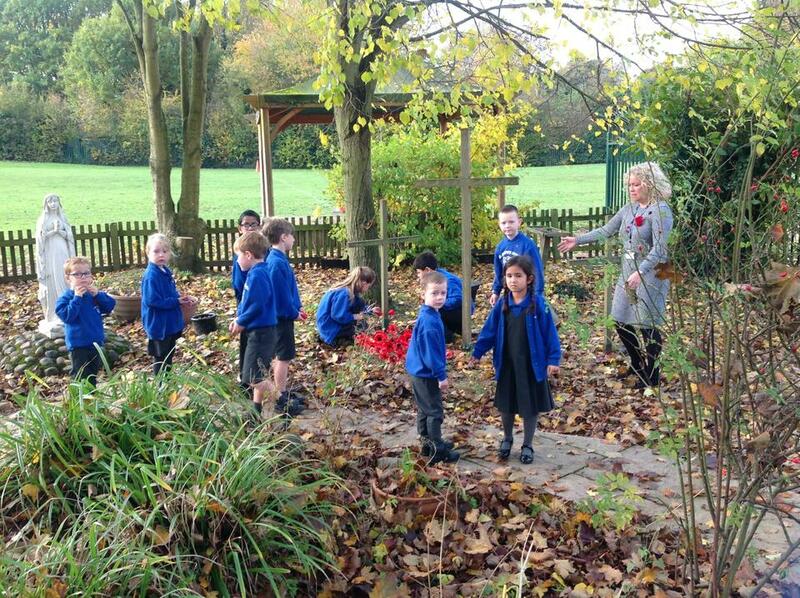 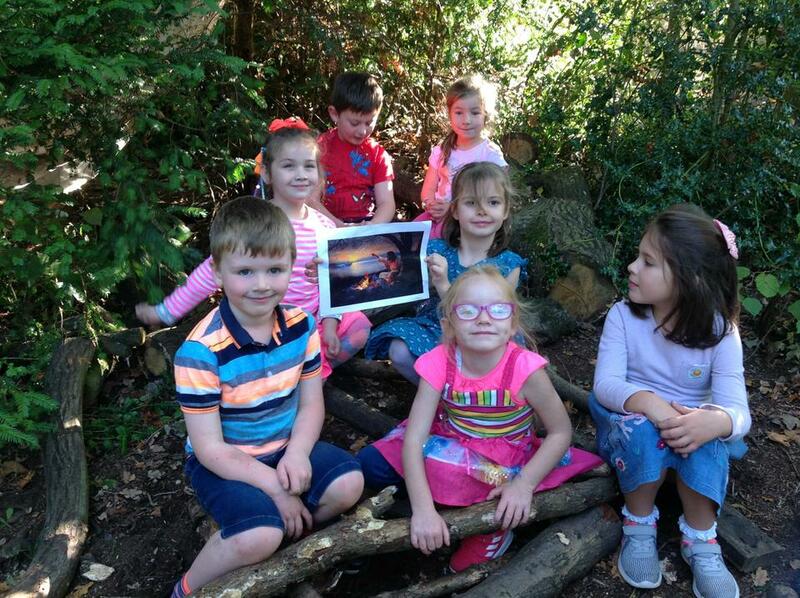 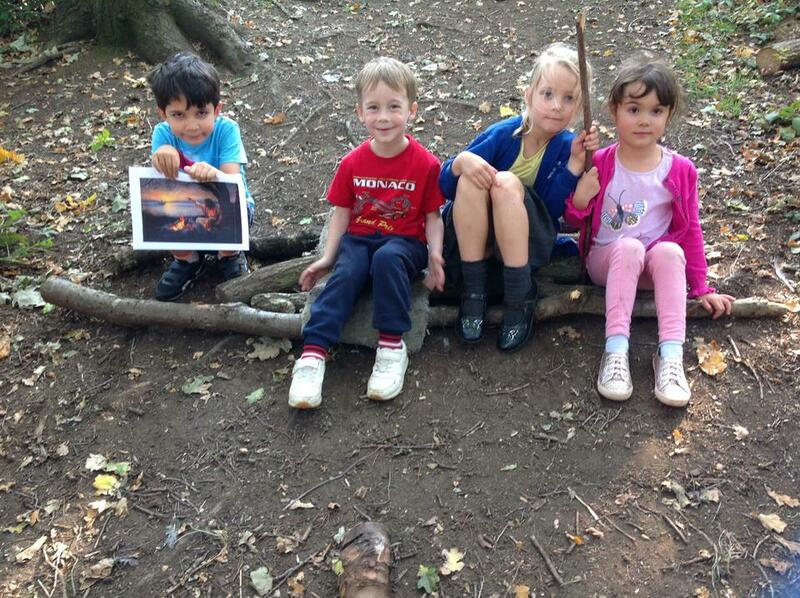 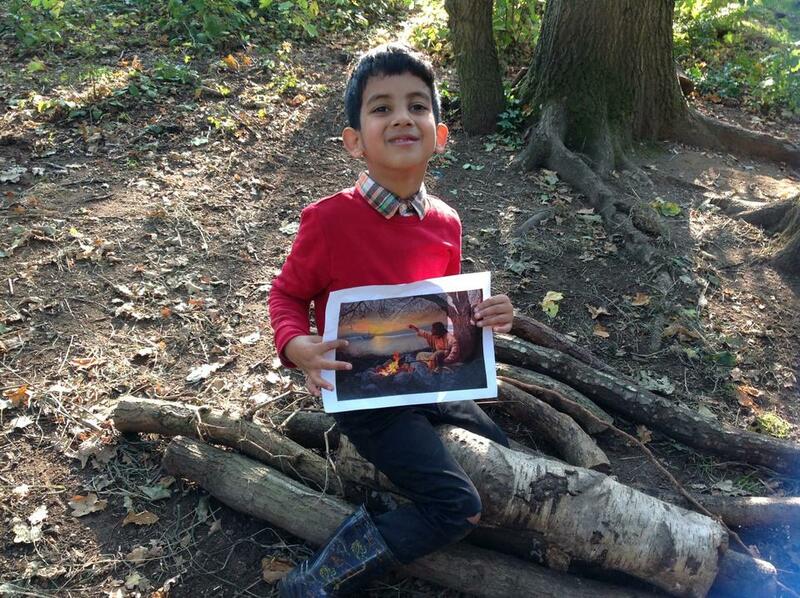 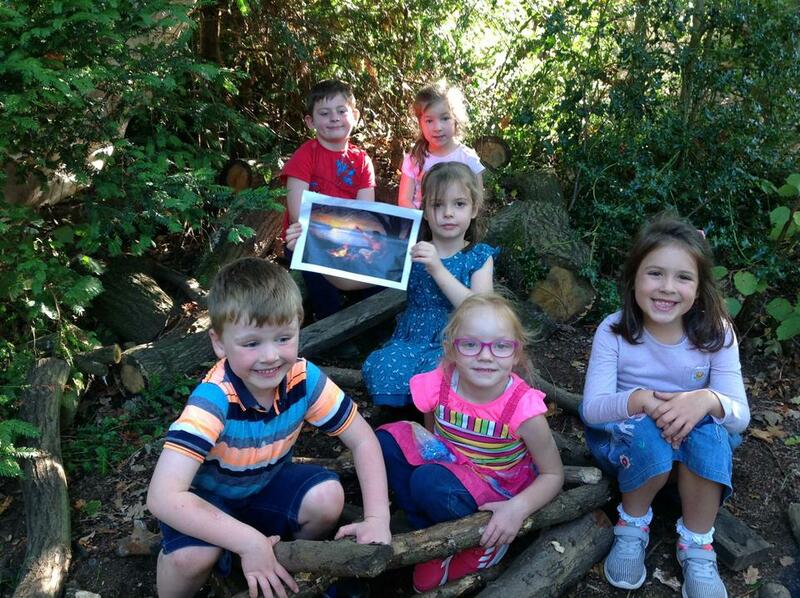 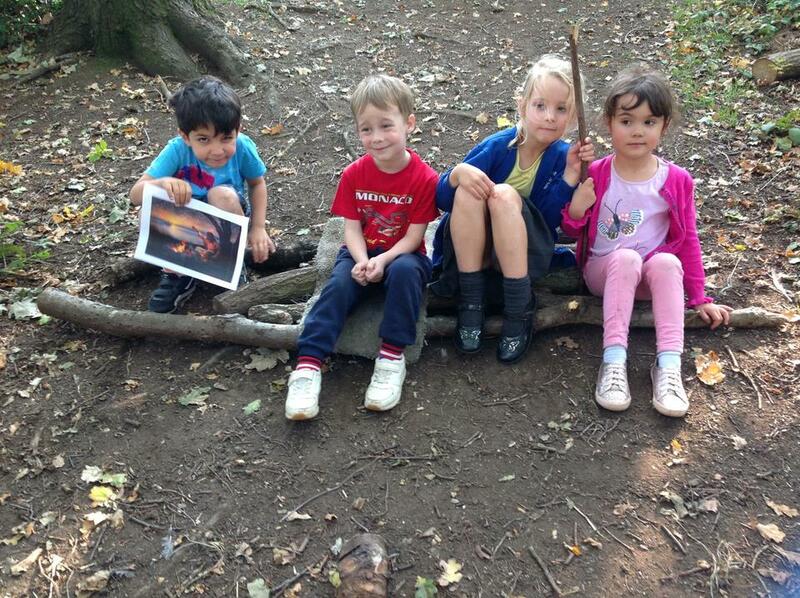 They then chose to use our forest school environment to build boats like the fishermen's boats in the painting.